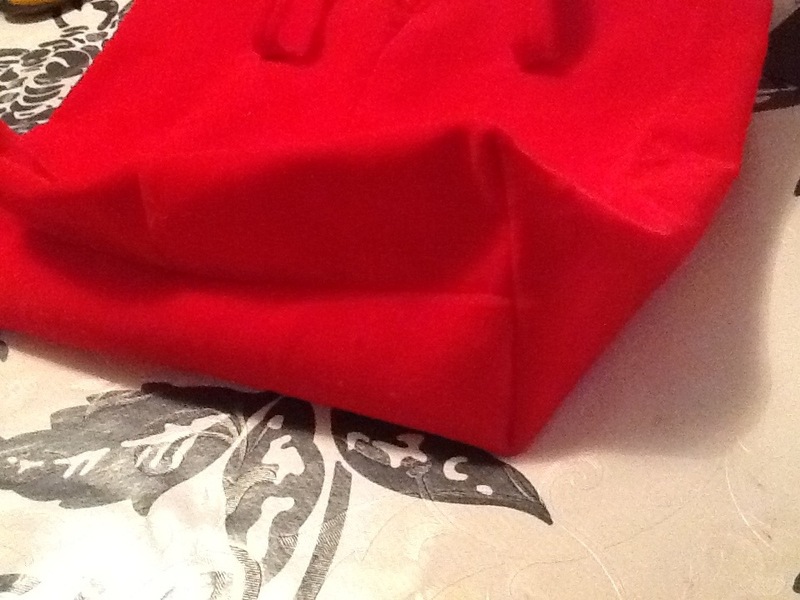 Sewing projects | ARTZCOOL'S BLOG! Ok, so my apologies for not being very consistent in sharing lately. I have a whole bunch of things to share! 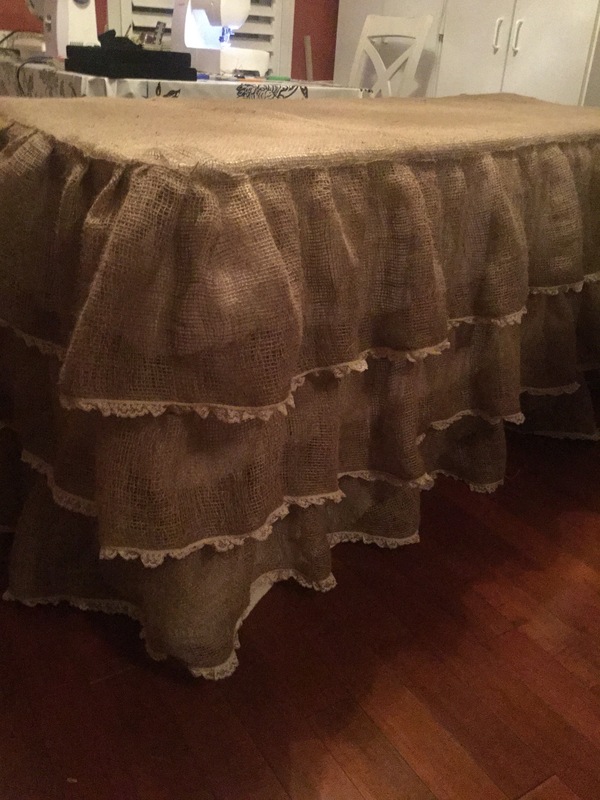 I will start with my burlap tablecloth because I was pretty happy with the way it turned out. 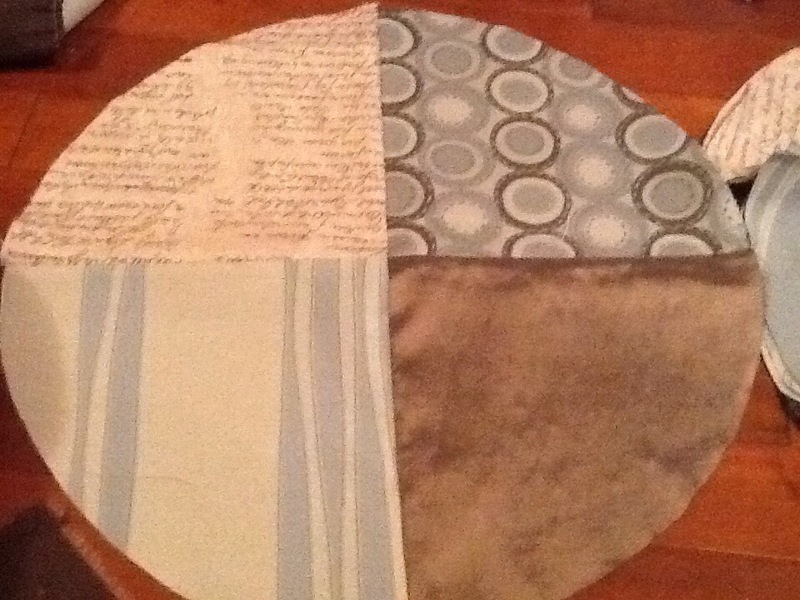 When I was doing the craft sale circuit before the holiday, I decided that I needed a nicer covering for the fold out tables that are normally used. So I did a little research, and I love the look of burlap and lace together. 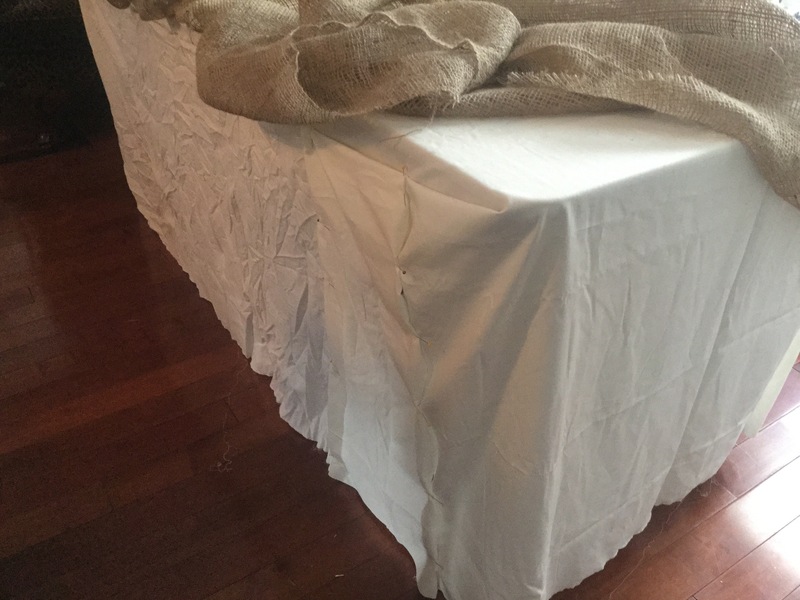 So, I bought a plain old roll of burlap from Home Depot for about $10. And I dug out an old queen sized sheet I had saved especially for a project like this! I love it when my hoarding tendencies pay off! 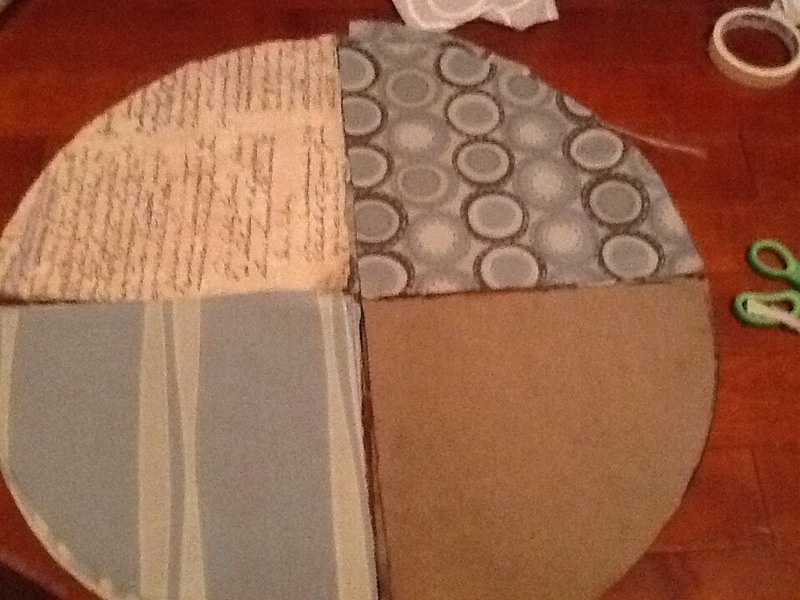 Anyways, I started by piecing together the sheet so it fit around the table. I decided it was better if it went right to the ground to cover up the mess of boxes I am usually storing underneath. As you can see, I just pieced it together without really worrying what it was going to look like because it isn’t actually going to show. Then I cut a piece of burlap to fit the top, with about 3 inches extra on each side. 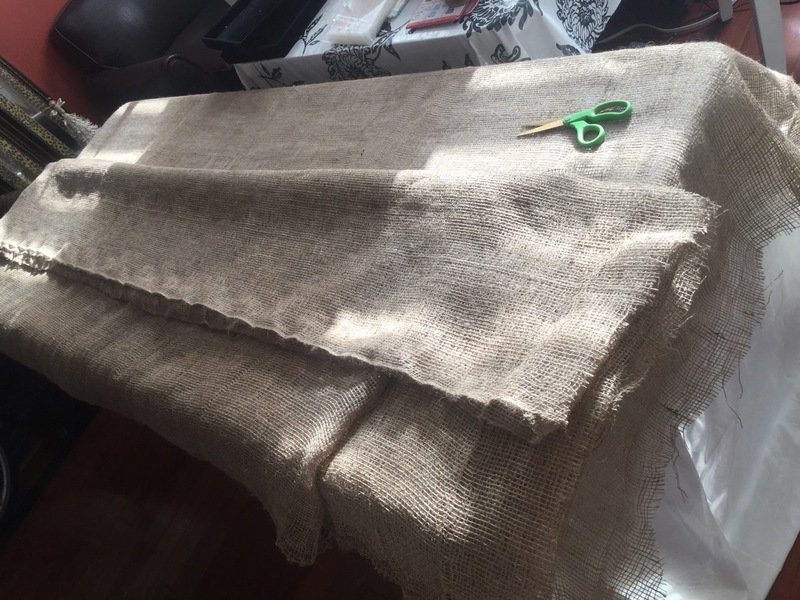 I also cut the remainder of the burlap into strips about 8 inches wide. 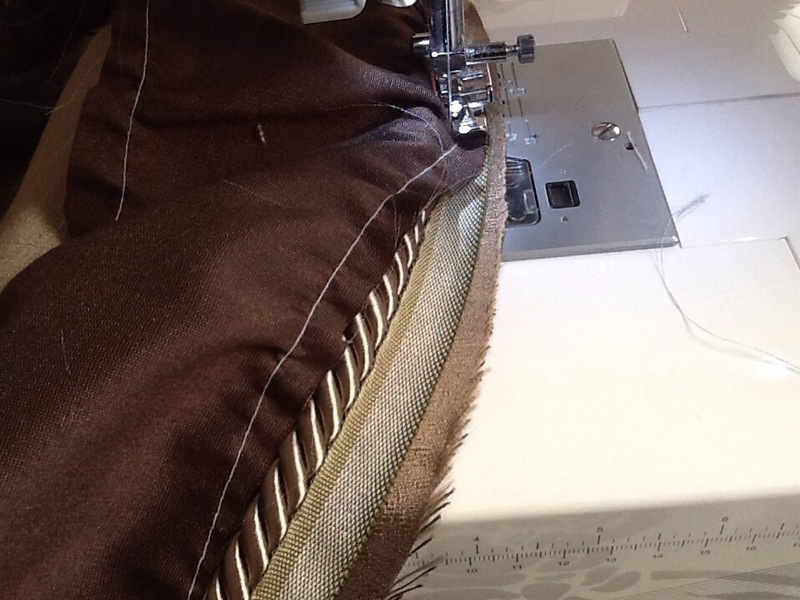 I don’t normally pin before I sew, but when I am working on a large scale and sewing a 6 foot seam, it makes a lot more sense to pin. 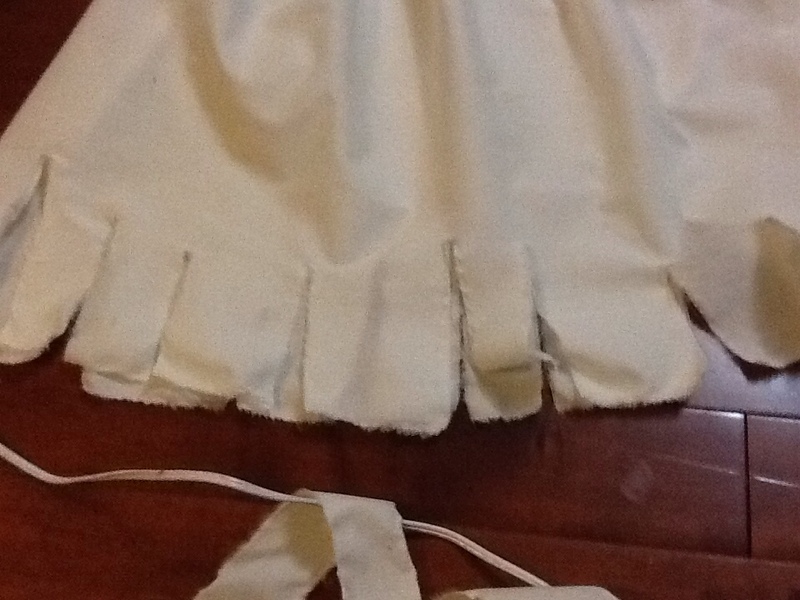 So I stated at the top, and basically pinched and pined a little gather every six inches or so to make the Ruffles. 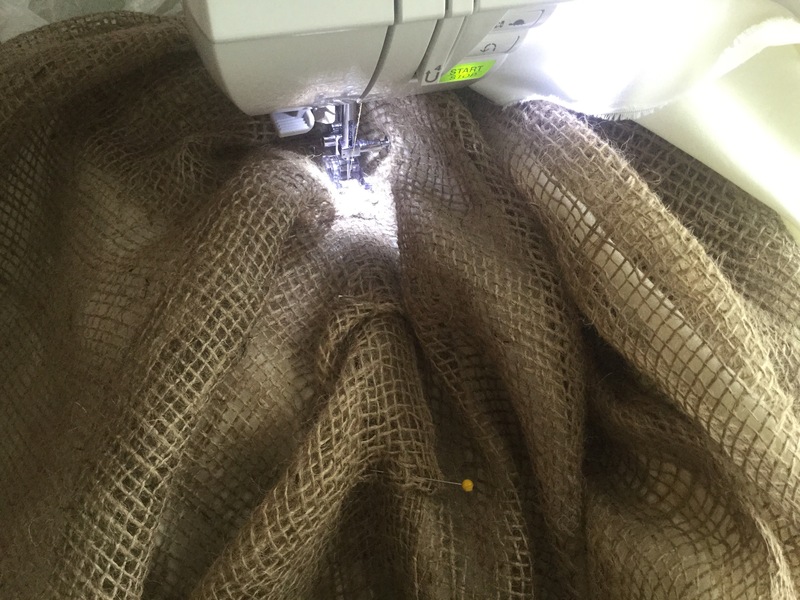 I roughly measured at this point to see that I had enough burlap to make three layers of Ruffles to reach the ground. 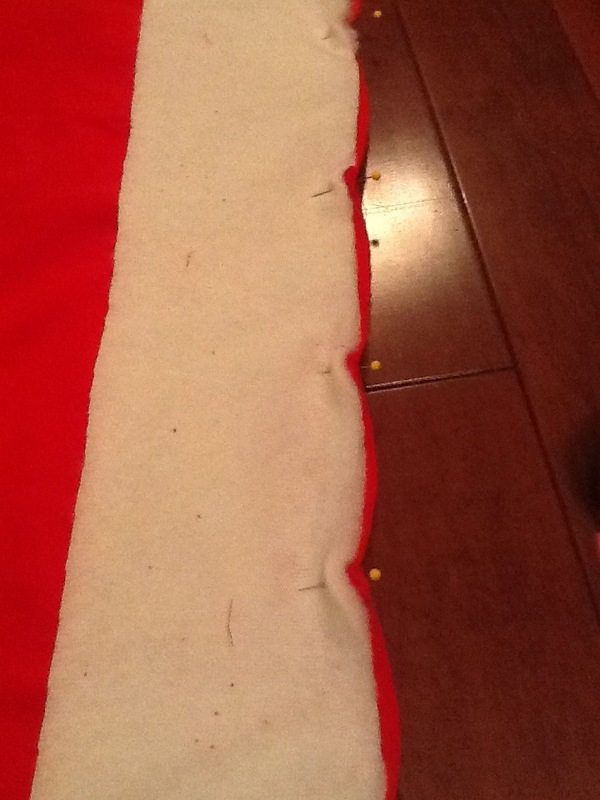 Then I sewed right on top all the way around. With a material like burlap, I figured there was no need to hide the seams. 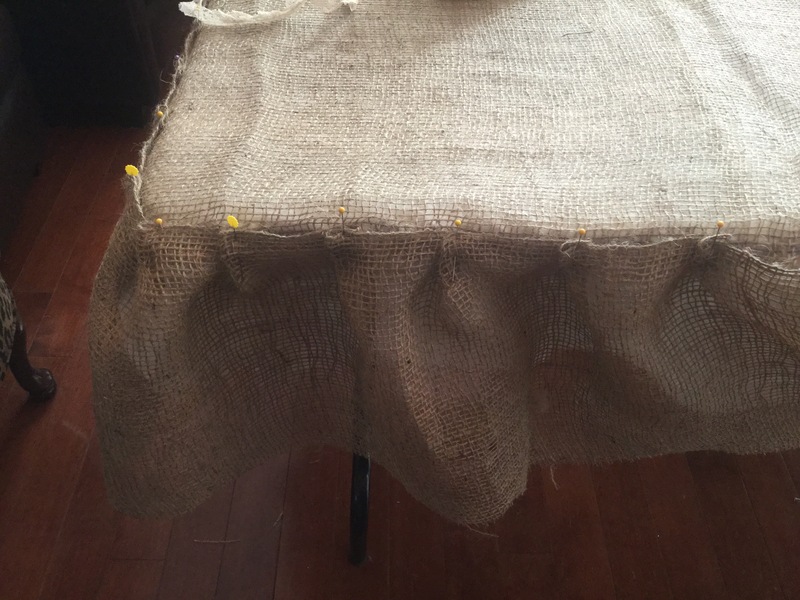 The stitch lines are barely visible on the burlap. I was going to leave the edges raw, but I ended up turning them up, and adding a little ruffled lace around each edge. 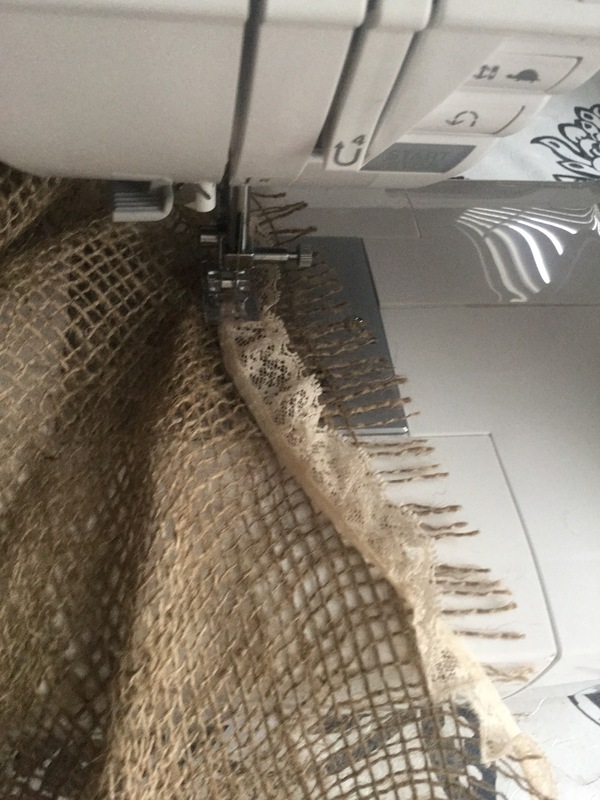 The photo below show me adding the lace without turning the burlap edge up, but I ended up deciding that it would be a lot more durable, and wouldn’t fray as much if I turned it under. 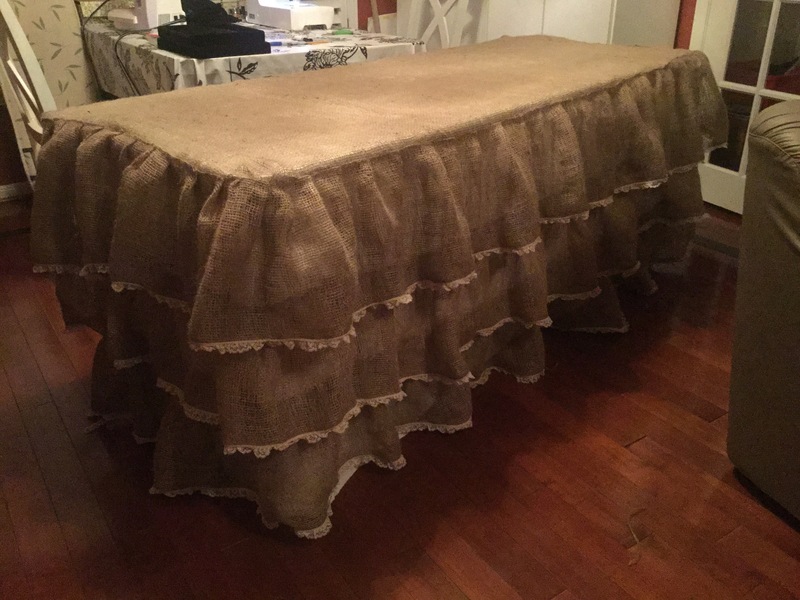 The table ended up taking three rows of ruffles. Things I would do differently… I would sew the Ruffles from the bottom to the top, that way I could space them out better. 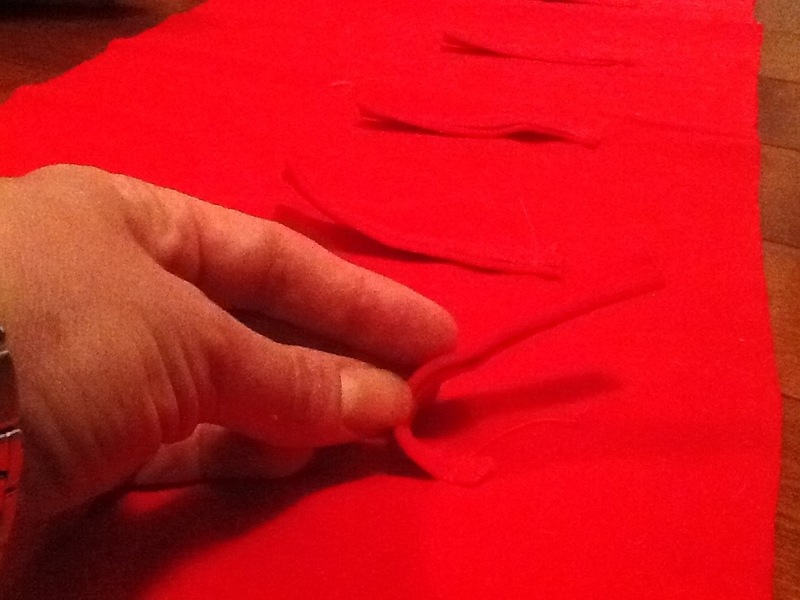 I would also add the lace trim before attaching it to the table cloth, this would have been much easier to work with. Here is the finished product! I might have to sew in a little weight at the front to stop it from slipping. 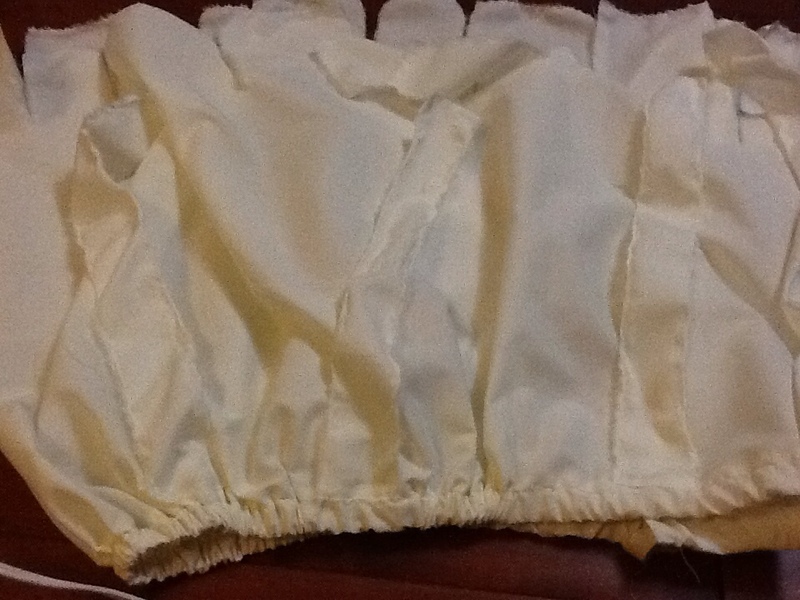 Because I only added the Ruffles to three sides, it is a little front heavy. Not a big deal when my stuff is on the table, but slips a little when the table is empty. One of the cool things about being a little crafty is that my friends are always sending me ideas! 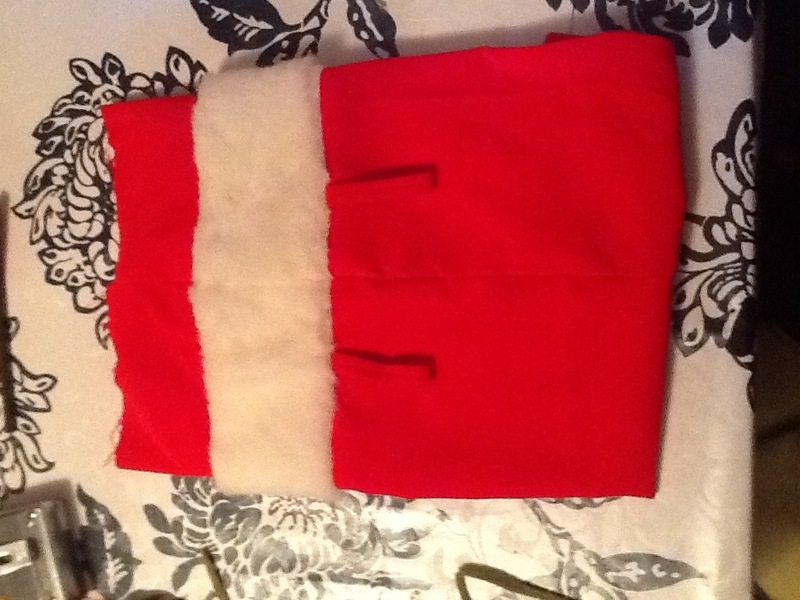 The day I was sewing this, my friend Marlee sent me this link for a burlap tree skirt. 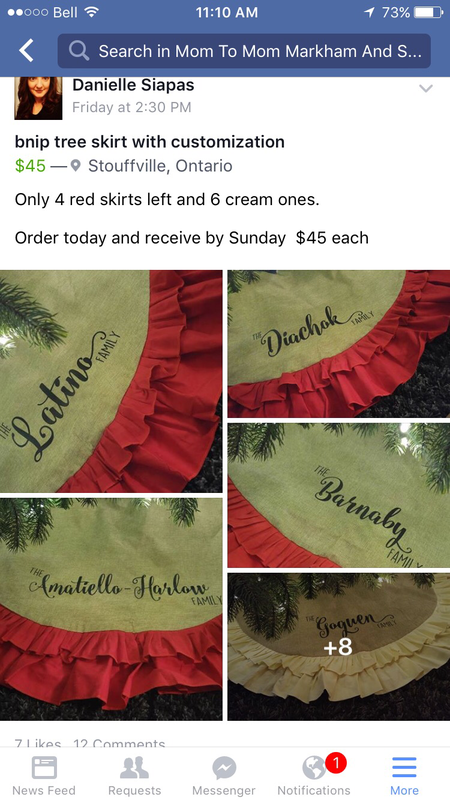 I think I might just have to make one before next Christmas.. Too bad I used all of the burlap! 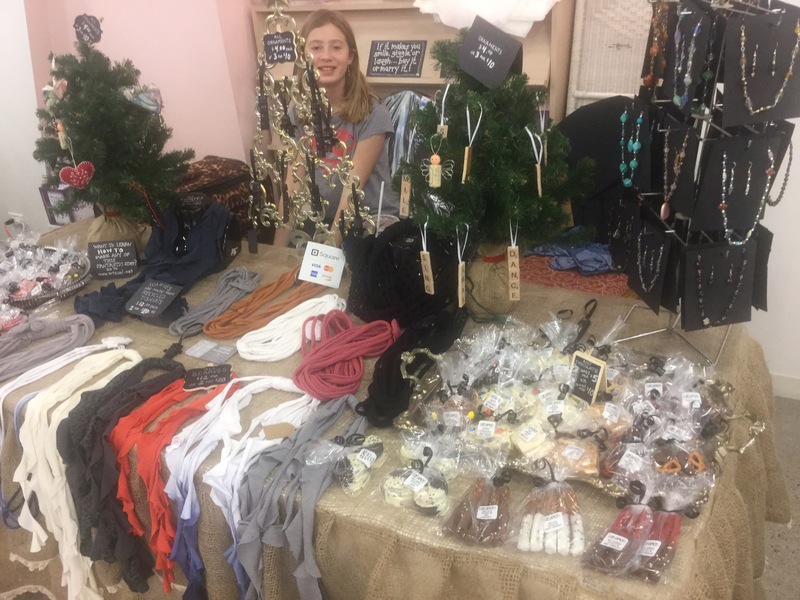 Here is not such a great photo of the table cloth in action at my last craft sale. Thanks again for helping Sam! 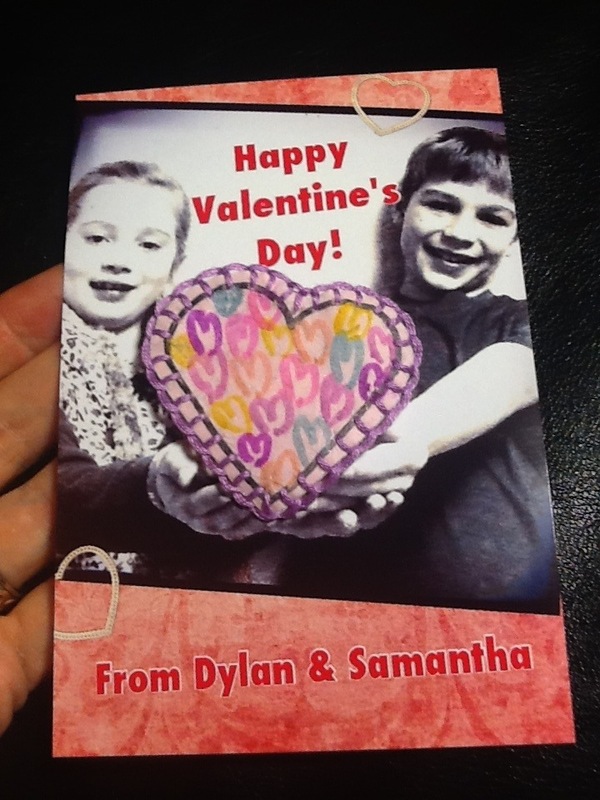 Maybe by Easter I will get around to posting a couple of my Valentine’s Day projects! Have a great Sunday night. 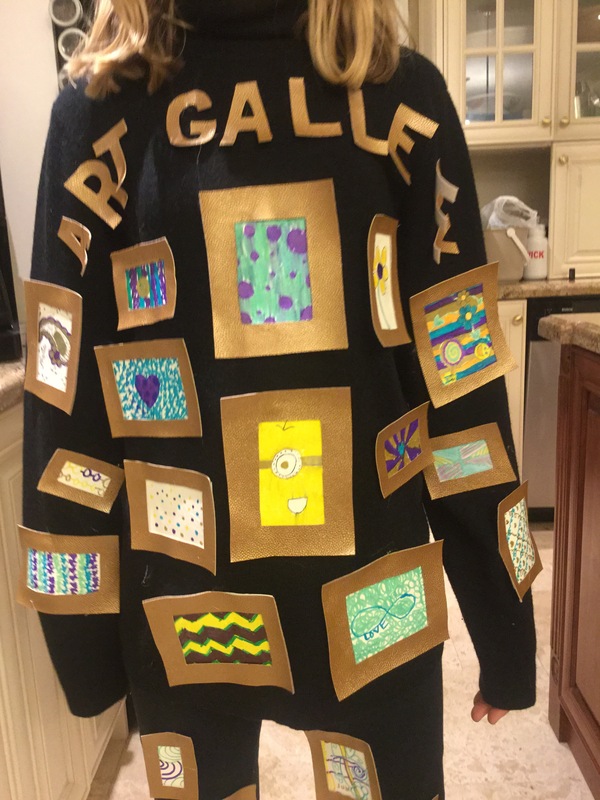 How to dress up as an Art Gallery! My daughter decided that she wanted to dress up in matching costumes with her best friend, which sounds great, right? 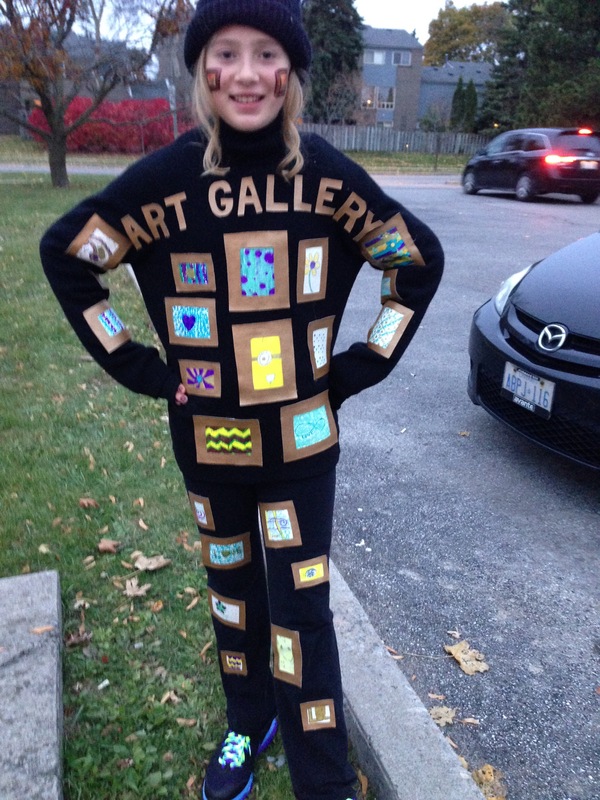 After some debating, they decided that her friend was going to be an artist, and she was going to be a gallery… What? A gallery? What happened to a doggies or clowns! 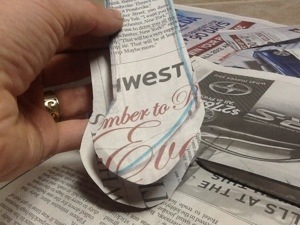 So, I do what I always do when confronted with a crafting dilemma… Or any dilemma for that matter… Google it! Or if that doesn’t work, try Pinterest. 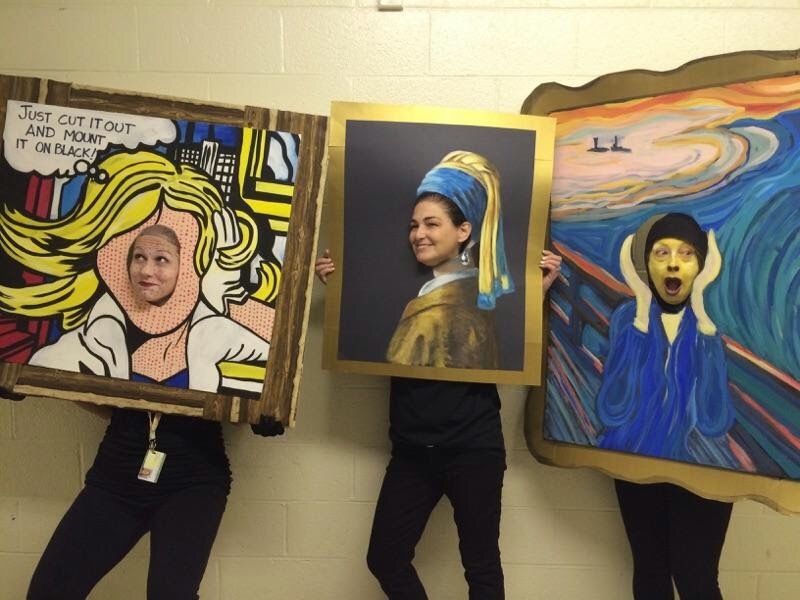 (Sometimes in the reverse order) but the only ideas I could find were costumes that were actual paintings, which were really cool, like the one below, but not what she had envisioned. 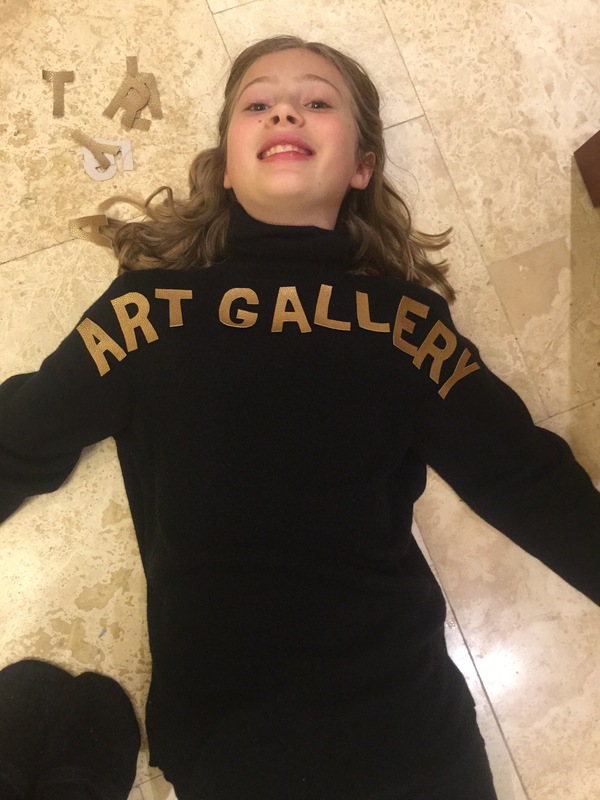 She didn’t want to be just one piece of art, she wanted to be the whole gallery! 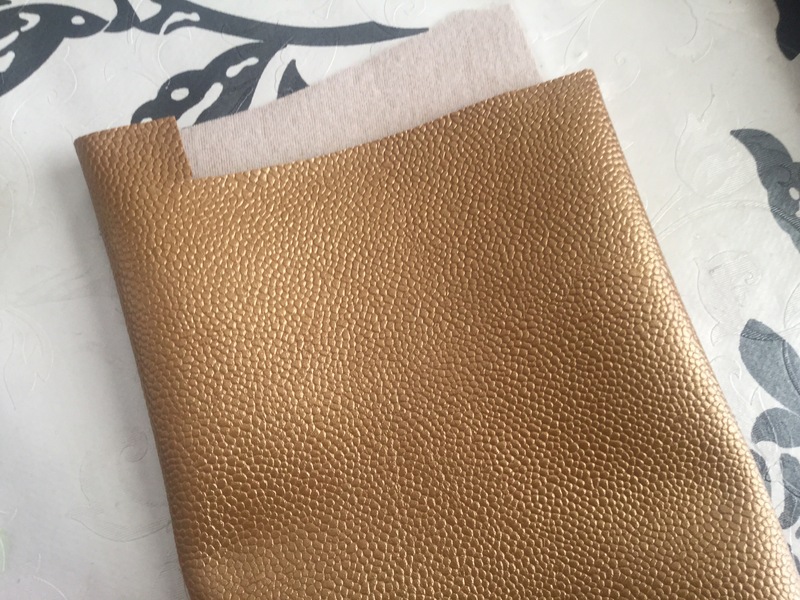 So, we started at fabric land and bought some gold leather-like fabric that we thought would work well to make picture frames. We cut out a bunch of frames in various sizes. Then, we cut some white rectangles to go inside of the frames. We ended up using some white leather scraps, and sharpies. 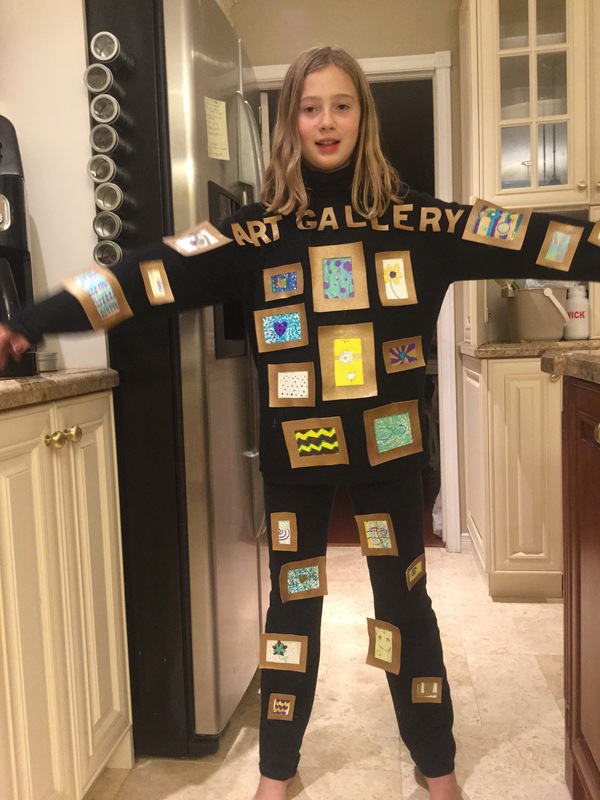 She took the white squares into school and had a few of her friends design the pieces of art. Then we glued the artwork inside the frames. Here is what they looked like laid out on our kitchen floor. And here is what Sam looked like laid out on our kitchen floor. Lol. 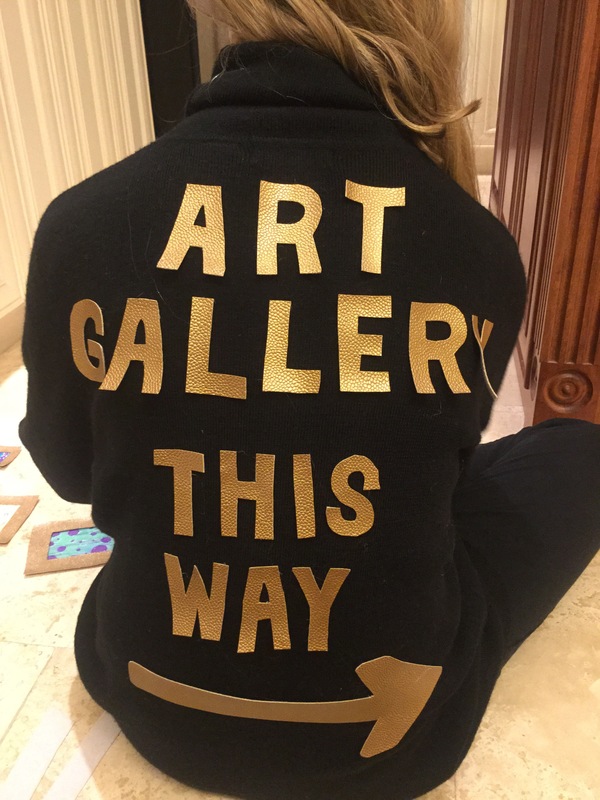 We used the same gold leather to cut out letters spelling “art gallery” and we wanted the make sure they were spaced out evenly so we put a dab of hot glue on each letter to hold them in place. We also tacked down all of the artwork with a drop of hot glue. We wanted to make sure they were all appropriately placed, which was why we did it when she was wearing it as opposed to just laying it on the floor. We did exactly the same thing to the pants. Then we decided that the back needed something, so we cut out and added some more letters. She took off the shirt and pants and we glued around each frame and letter. 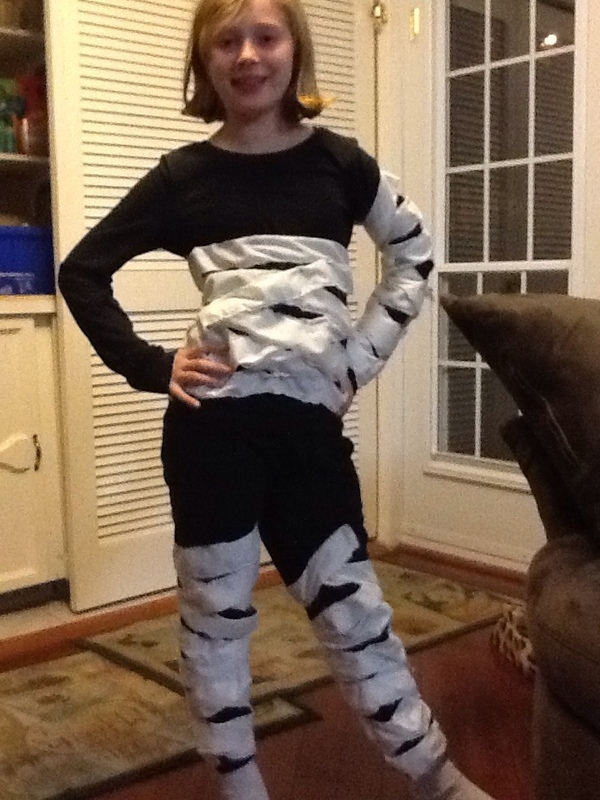 This is what she looked like on her way out to go trick-or-treating. We added a couple frames on her cheeks with face paint. I think it turned out well. The hardest part was coming up with the idea! But, she was happy, and that is the most important part. 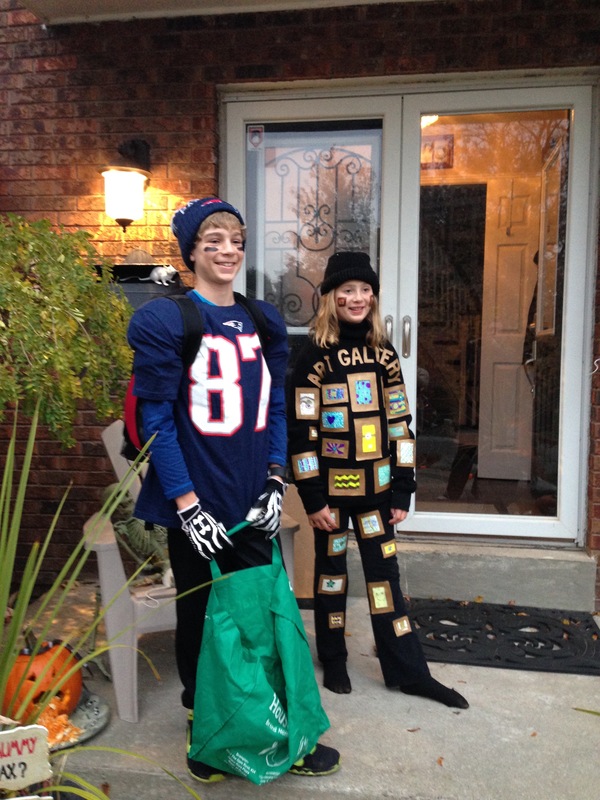 Im upset that I forgot to take a picture of her and her friend together in their costumes! I don’t know if you can tell by the looks on their faces, but they really weren’t that excited about making their friends wait for them to go trick-or-treating until I took a few photos…just wait until I tell them that I want a photo with Santa again this year! I know this post is a little late, but better late than never right? I’m just thinking of it as being really early for next year! It has been a crazy couple of months, and I have lots of posts to catch up on! 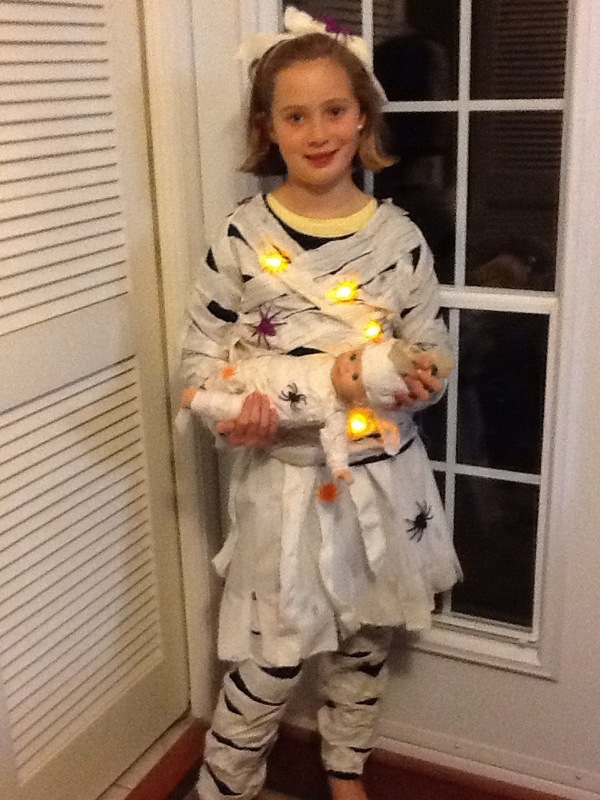 Sam had the cool idea for her Halloween costume this year of being the Mommy of a mummy. 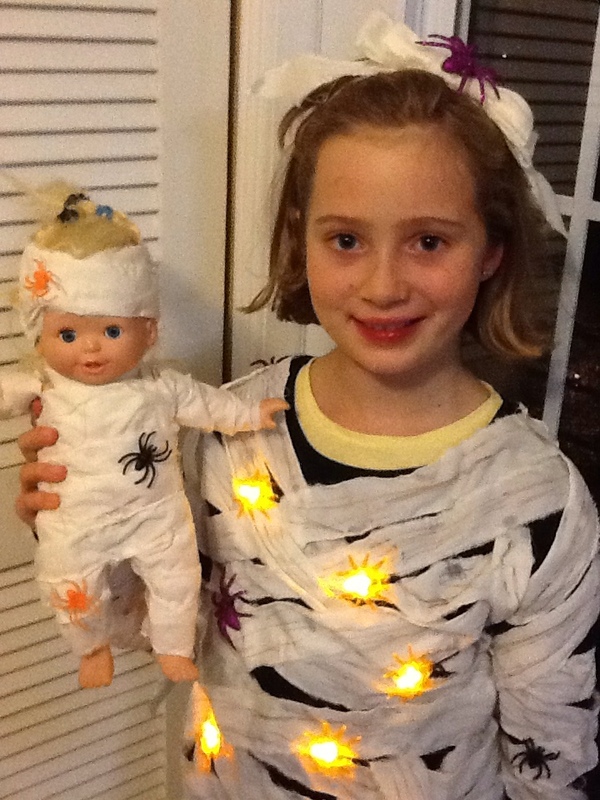 She wanted to dress up like a mummy, and dress up one of her dolls too. So, we got down to some serious work the other night. 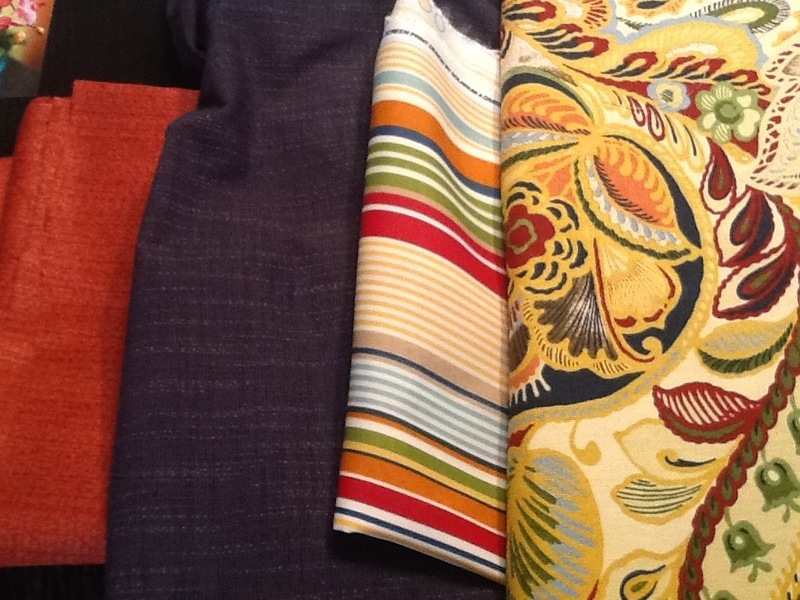 At fabricland, I bought 2 yards of the cheapest broadcloth fabric, which was I thing three dollars a yard. We ripped it into strips about an inch and a half wide. Sam loved ripping the fabric! I have to agree…. 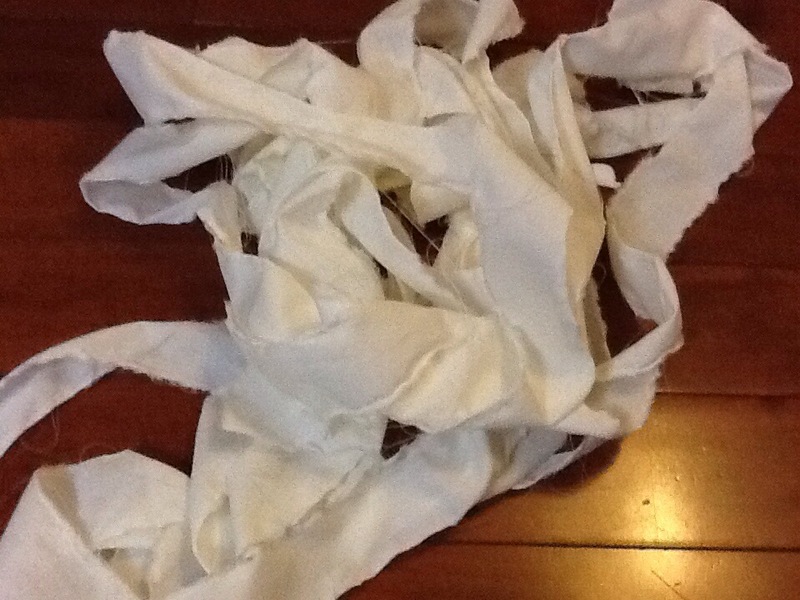 there is something theraputic about the sound and feel of ripping fabric apart. 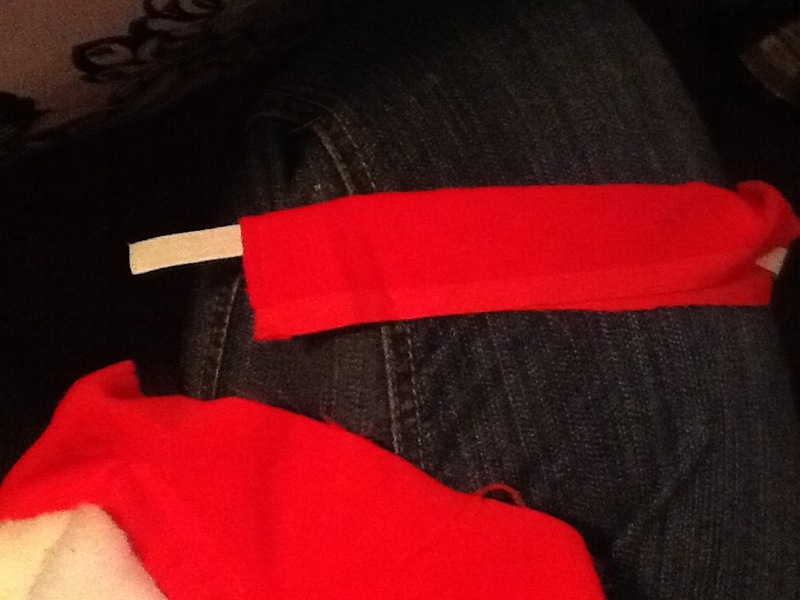 Anyways, we ripped a bunch of strips the length of the fabric. And we started with an old black shirt and track pants. Sorry, I forgot to take a picture before we started gluing… we were just too excited to start! 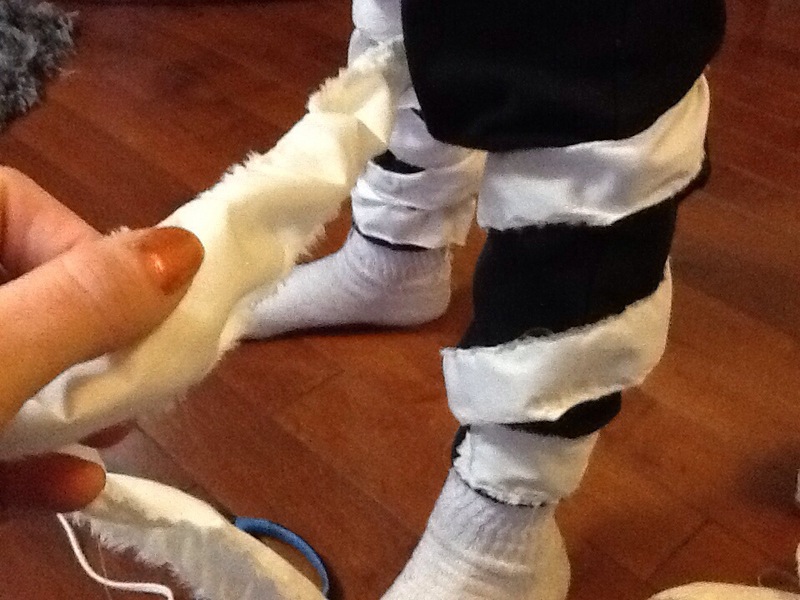 So, as seen in the pictures, she put on the black shirt and pants before we started gluing the strips. 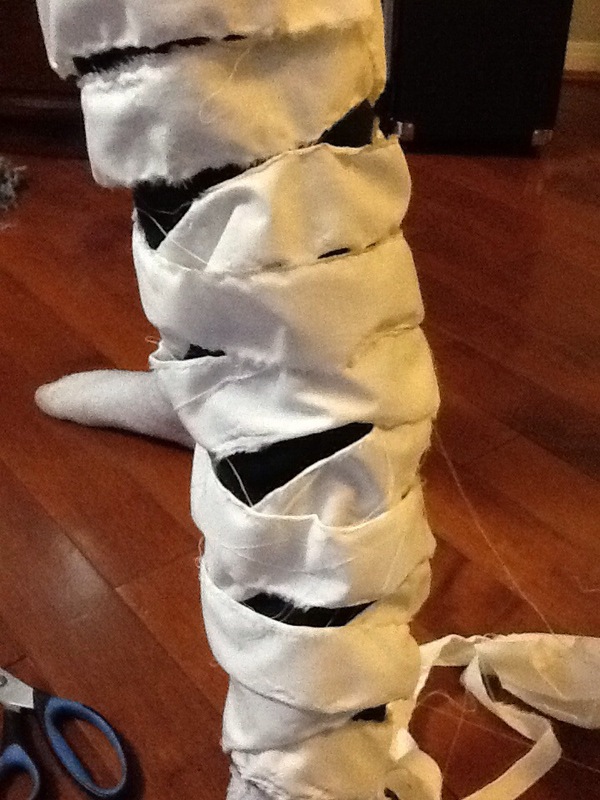 I used a low melt glue gun and started from the bottom, and wrapped around as loose as possible. We wanted to make sure she could take everything off and on after. Then, we used a second piece to wrap around the opposite way. I glued a tiny blob of hot glue every few inches. I have to admit that I should have wrapped a little more loosely around the body. To get out of the costume, Sam needs help and it is a little like escaping from a straight jacket. So, thinking that at some point during the day she might want to sit down, I decided that it would be a lot easier to make a little skirt, rather than wrap the rest of the pants. 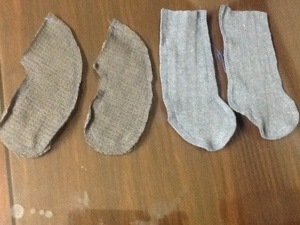 So, we took a strip of the broadcloth, and measured the length to her knees. 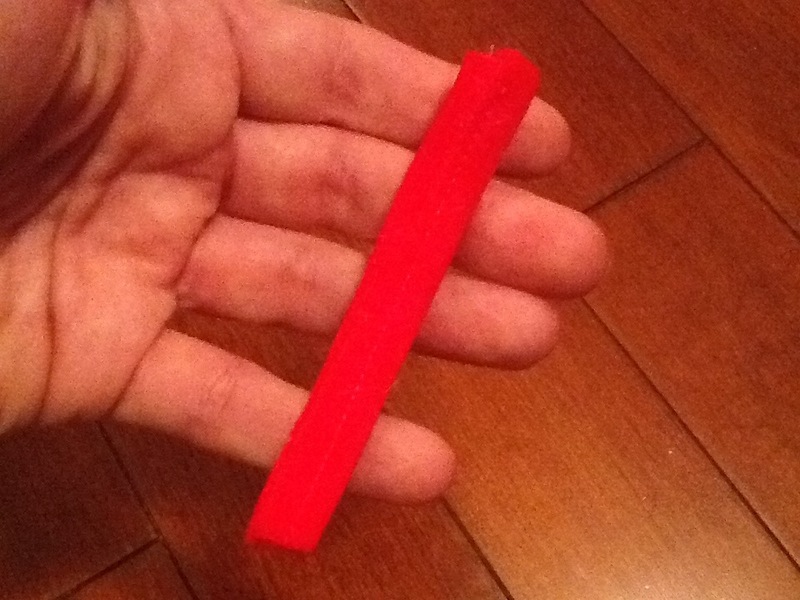 We folded over the top to add elastic at the top, and left the bottom raw. Then, we ripped slits into the bottom. They using a grey marker, and a couple brown markers, I antiqued or aged the bandages by drawing a bunch of lines. And we hot glued a bunch of spiders. 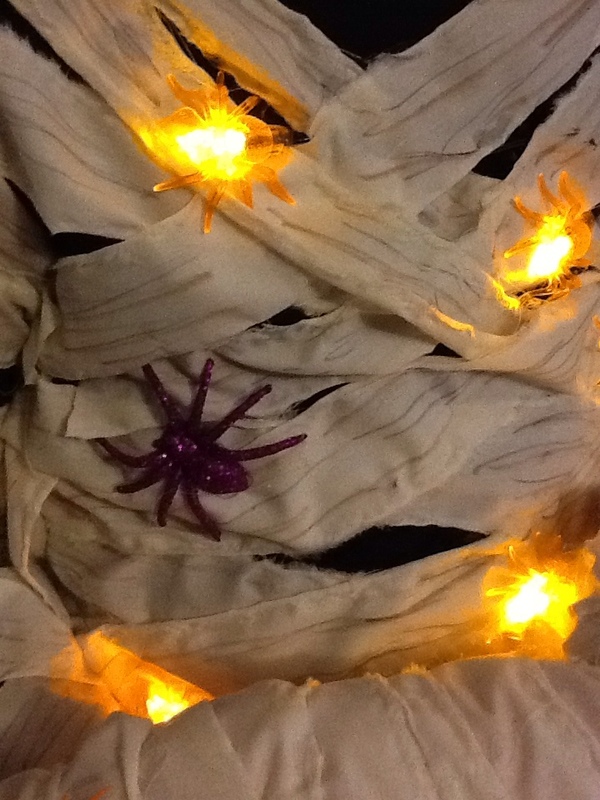 I also got a short string of spider lights from the dollar store that we wove into the bandages. I think that was one of my favourite parts, plus there will be no missing her at night when she is trick or treating! 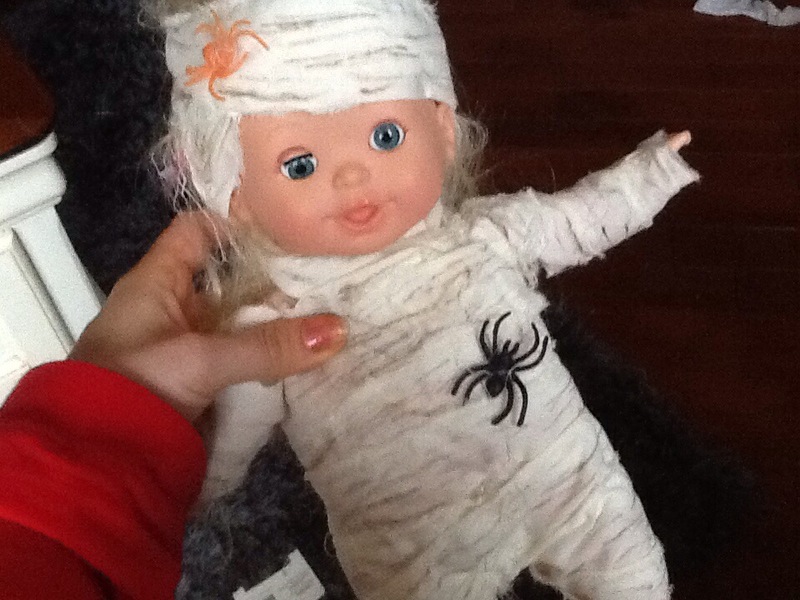 Finally, we mummified her doll, by covering her with strips of fabric too. 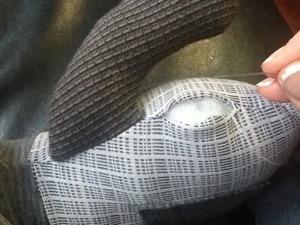 I didn’t want to ruin the doll, so I was careful to not actually glue the strips directly on the doll. And… here is the final product…. I have seen these infinity scarves all over Pinterest, and in every store, and fashion magazine lately. So, sooner or later, I had to make myself one! Sam has been bugging me to teach her how to knit, so I took her to Michaels yesterday. 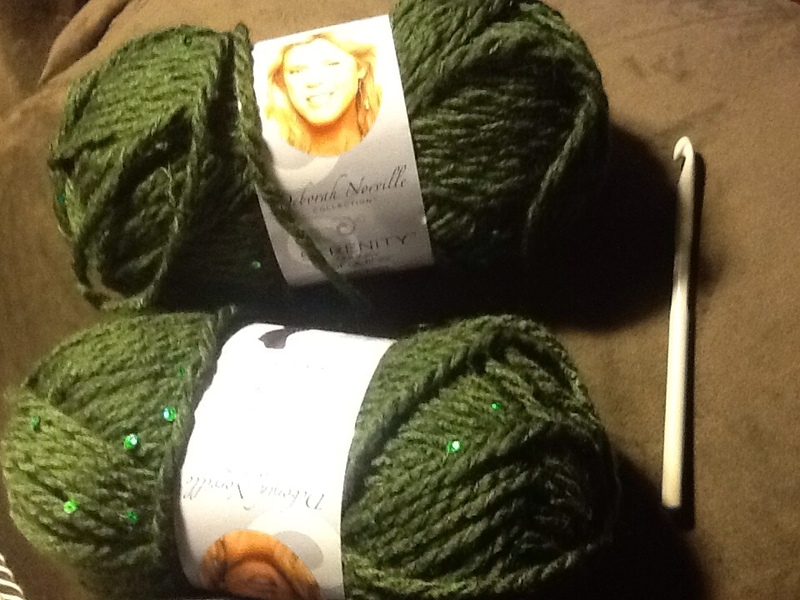 Of course, I ended up coming home with more yarn than she did. 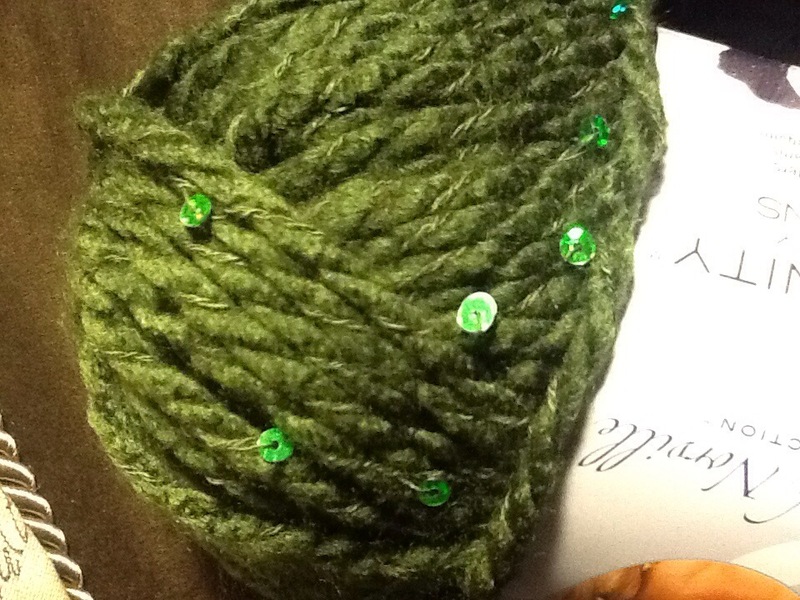 I loved the colour of this yarn, and it has even has sequins too! You can never have enough sparkle! I looked up a few patterns, and what I decided was that a length of about 6 feet would make a nice scarf that would wrap around three times. 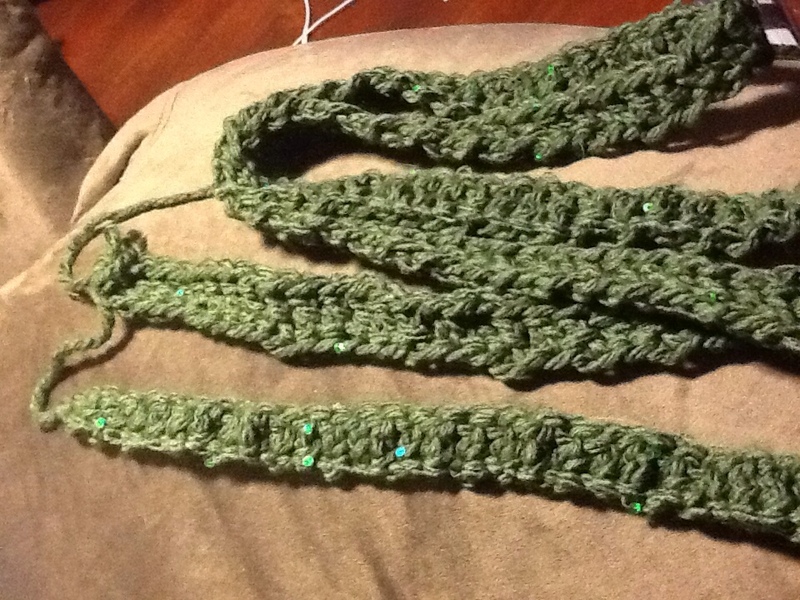 So I did a double foundation stitch to end up with a chain about 72 inches long. I used the biggest hook I could find which was a 7mm. 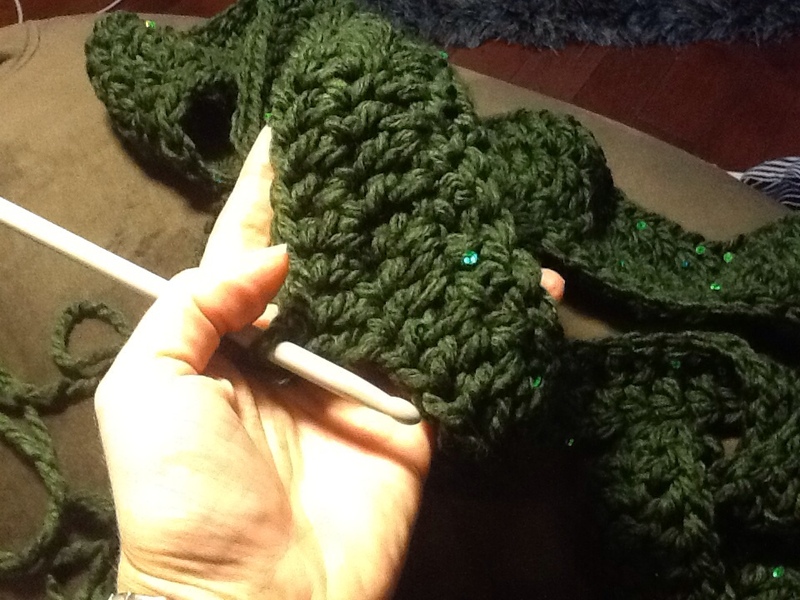 I connected the two ends so it was a huge continuous loop, and crocheted a couple more rows. 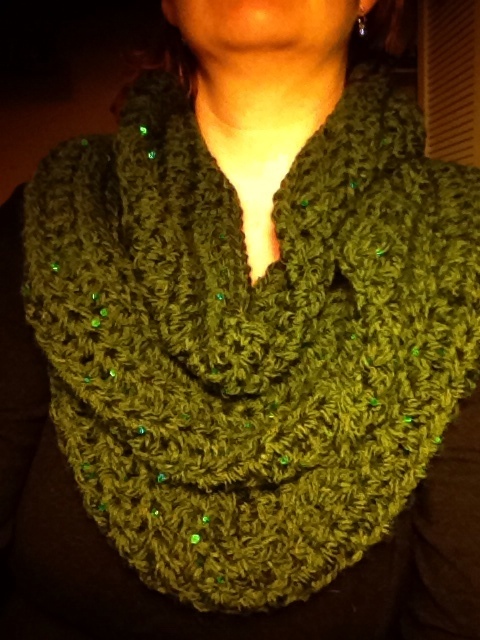 This is what it looked like..
Because it was such a chunky yarn, and I used a pretty big hook, it turned out nice and fluffy, and the best part was that I had it done in less than a couple hours! Every little bit of warmth helps me when I think about the long winter we have ahead of us. I know it’s only fall, but man am I looking forward to spring, I am not loving the Canadian winters the last few years! 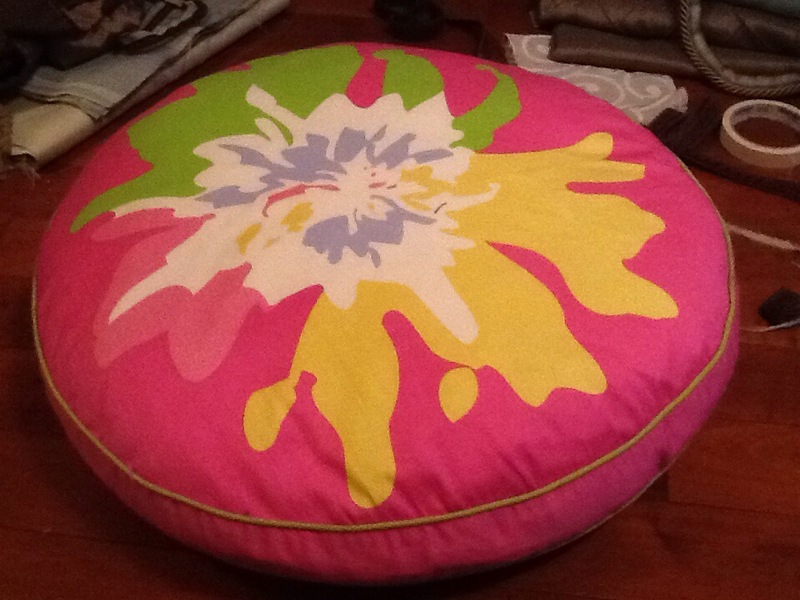 Making Pillows to match my brand new couch! Hope everyone is enjoying the second day back to school… only 294 days left until summer next year! I am actually looking forward to this school year. I will try to remember to share some of the stuff I am working on at school in my library! Since painting the fireplace and family room, we were working on getting the rest of the room done. We got our new couch delivered, and the walls and fireplace are all painted. We are still waiting on one more piece of furniture from the states to be shipped in… can’t wait to show it to you! I am sure I had a plan for the pillows when I bought them, but the hot pink covers just have’t fit in with any of my colour choices so far. 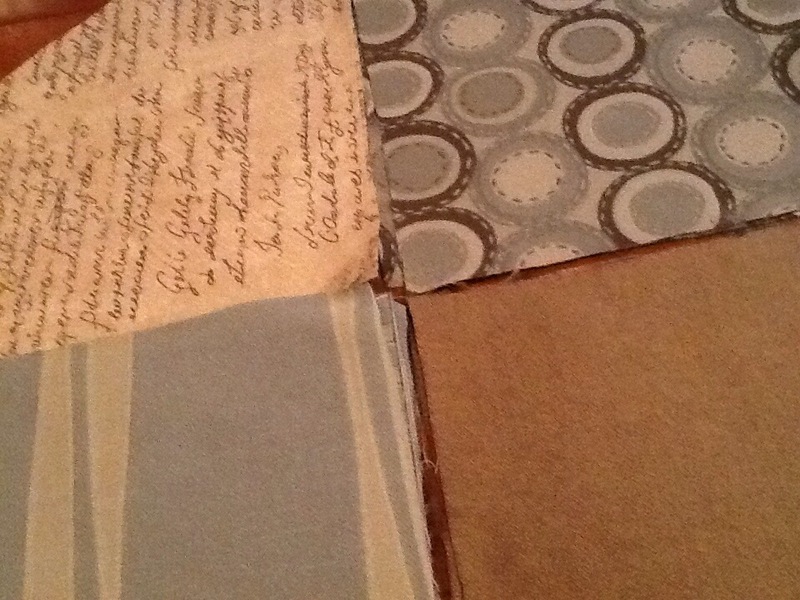 I found four different fabrics that I liked, and cut out eight quarters from each. 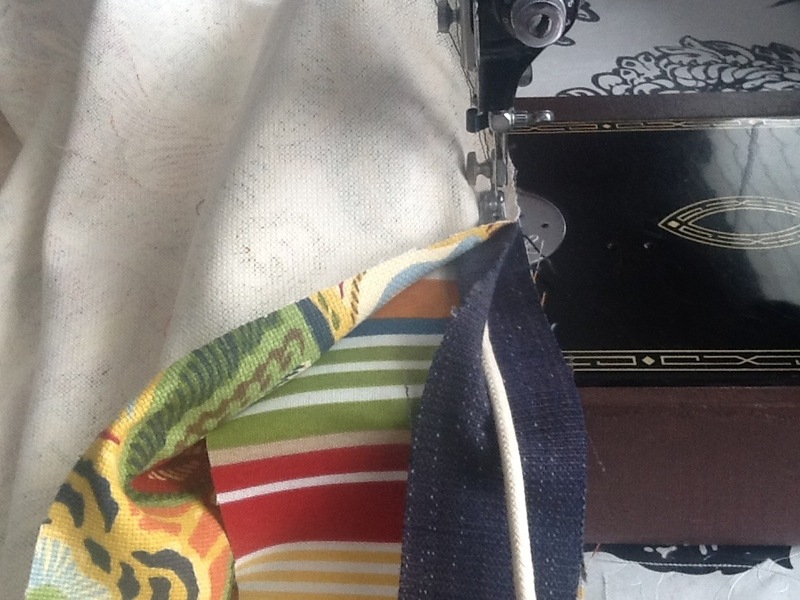 Next, I sewed all of the quarters together and pressed the seams open. I have found that pressing the seams open makes a big difference in the finished product. 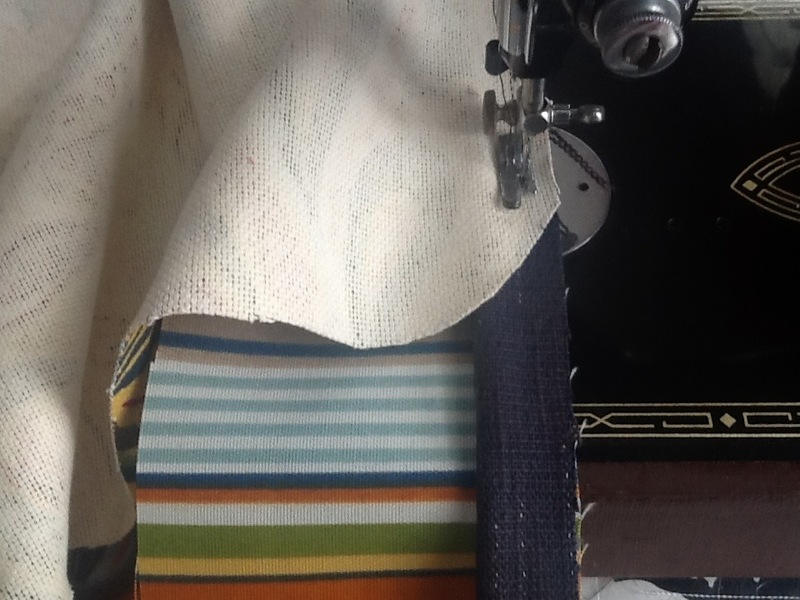 Then, to make the sides of the pillows, I tightened the tension on my machine and sewed down either side of a four inch strip of fabric to gather it a little. I did enough to go around all four pillows. A few months ago, I bought about 20 yards of cording on sale, for a really good reason that I just can’t remember right now (notice a pattern here?) anyways, boy am I glad I did, because if there is one thing I have learned about recovering uphostry, or pillows is that it always looks better with piping. 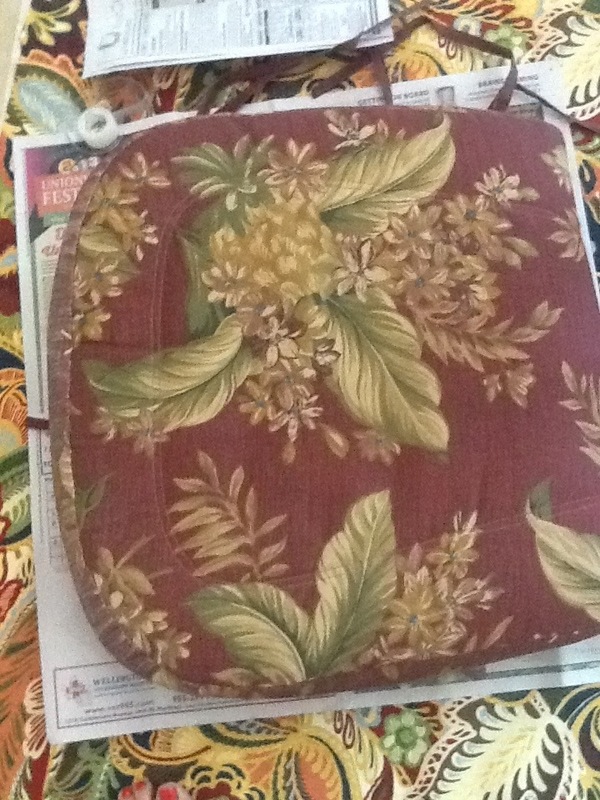 Then, I sewed one side of the pillow to the side panel, and put the piping in the middle. 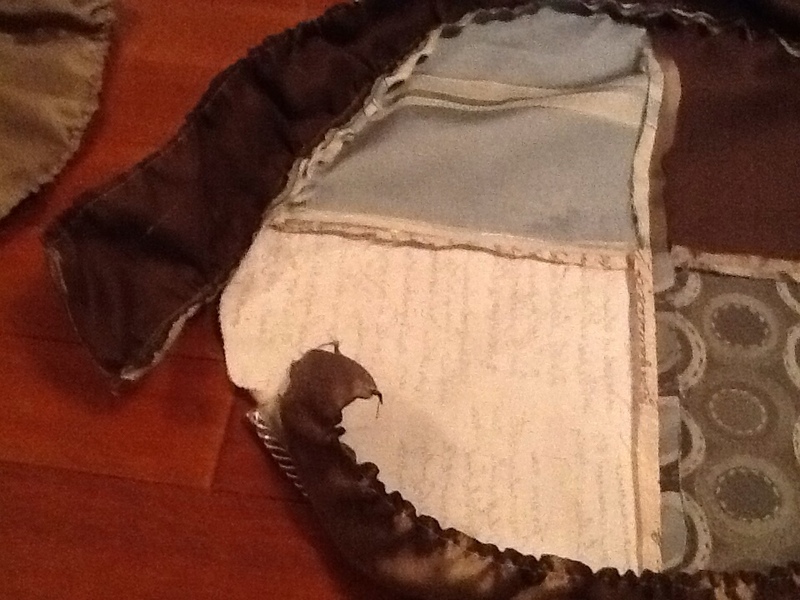 Once I had sewn both sides of the pillow to the side panels, I left a few inches open, squeezed my ugly pillows inside and hand stitched the openings closed. My sewing machine wouldn’t sew over the cording, so I had to figure out how to join the two ends without leaving them raw, because the cording unravels very easily. 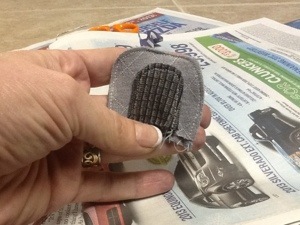 So I folded over the edges of a small rectangle of fabric and glued it to the join with a glue gun. Then, I hand stitched the rest of the opening closed. 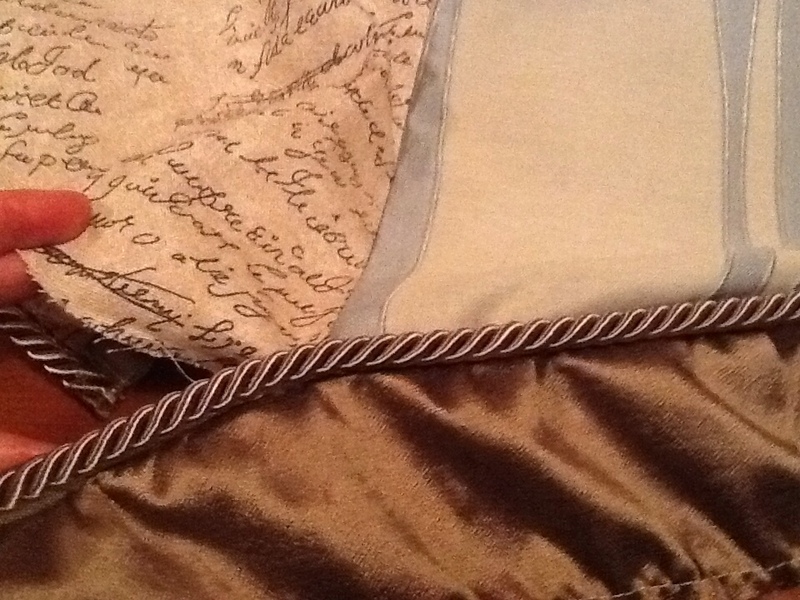 Not that you could tell from reading my blog lately, but I have actually been busy crafting the past few days. I have to be honest, I have been in a bit of a rut, starting school this month. I’ve been a little down, and haven’t felt too motivated to do anything by the time I get home. Working every day is hard! Also, I think I am mourning the end of summer…so I signed the kids and I up for about a dozen different categories at the Markham Fair. It has given me a list of fun ideas to try, with a deadline, so we have had fun making stuff. I just haven’t had time to write about them. 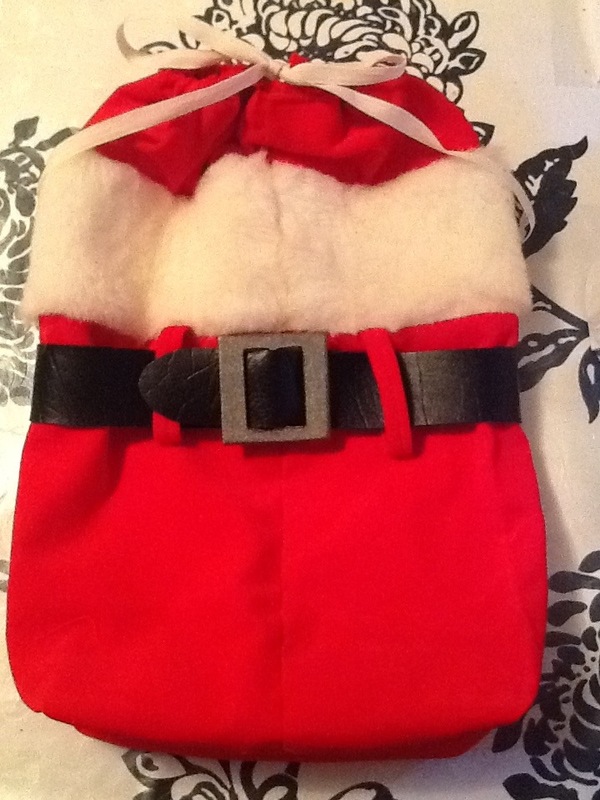 One of the categories in the fair was to make a festive bag. 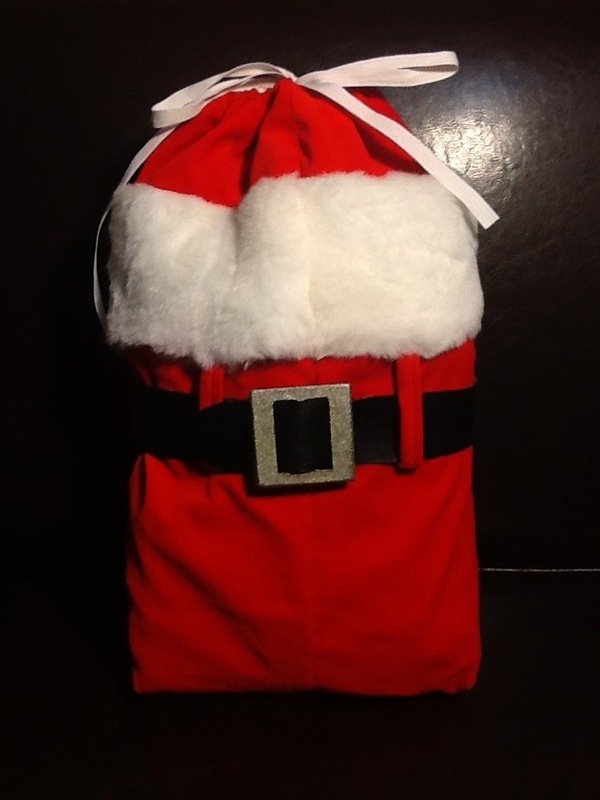 So, why not get an early start on someone’s Christmas present, and make their festive santa gift bag early? 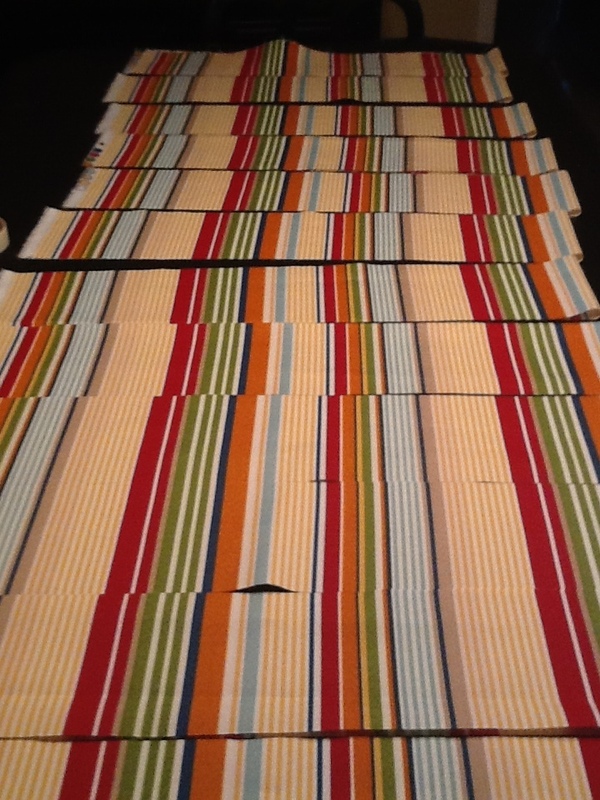 I started by cutting a bunch of strips of fabric. 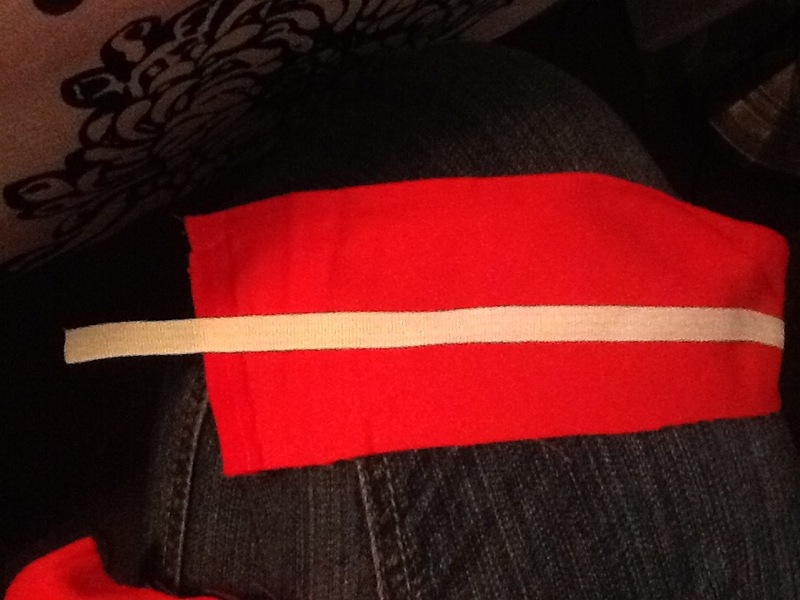 I cut a thick strip, about 10 inches wide of red fabric, and two more 2 inch strips of red fabric. 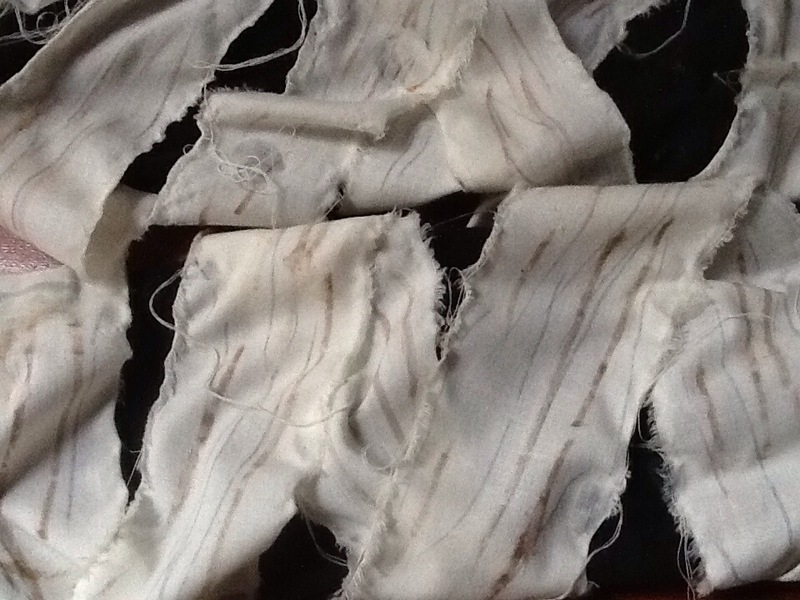 Then I cut a strip of white fur, about 4 inches wide. I also found a scrap of leather for the belt. 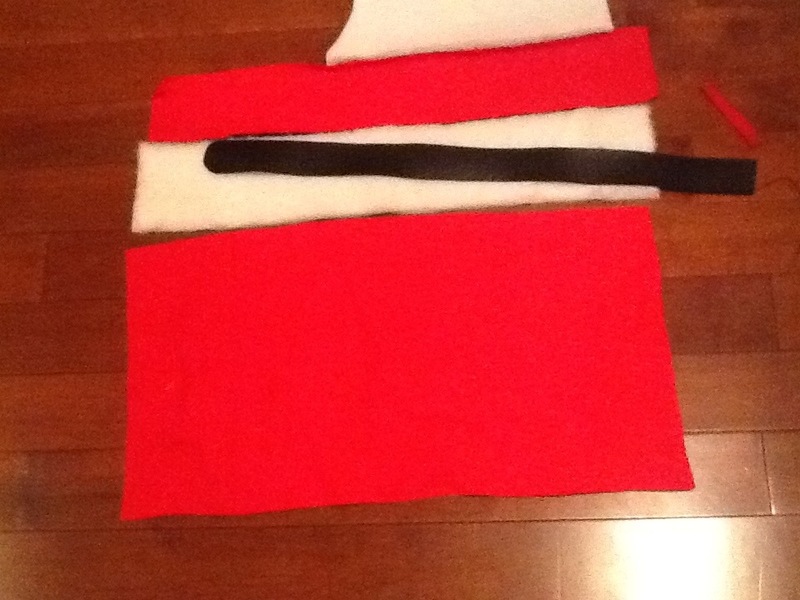 I cut another thin strip of the red fabric to make the belt loops. 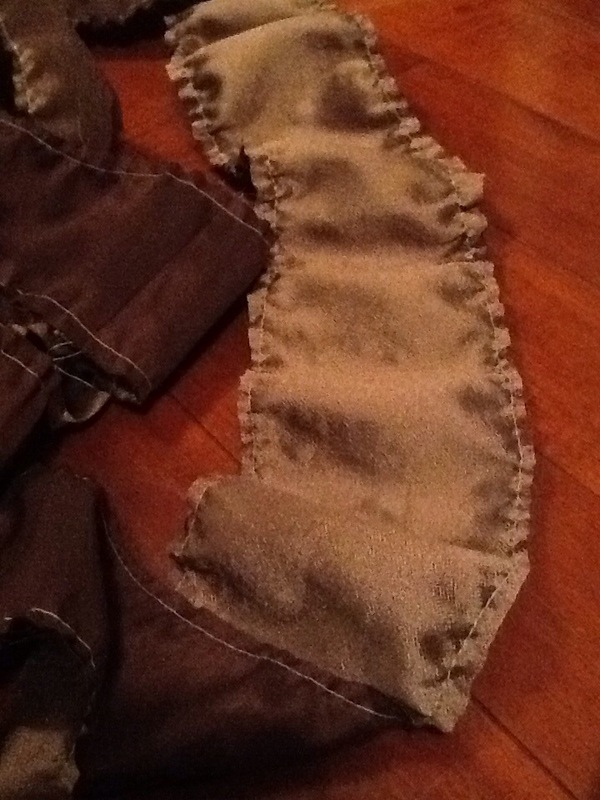 I turned in the raw edges, sewed them down the middle and cut the strip into five shorter pieces, one for each belt loop. 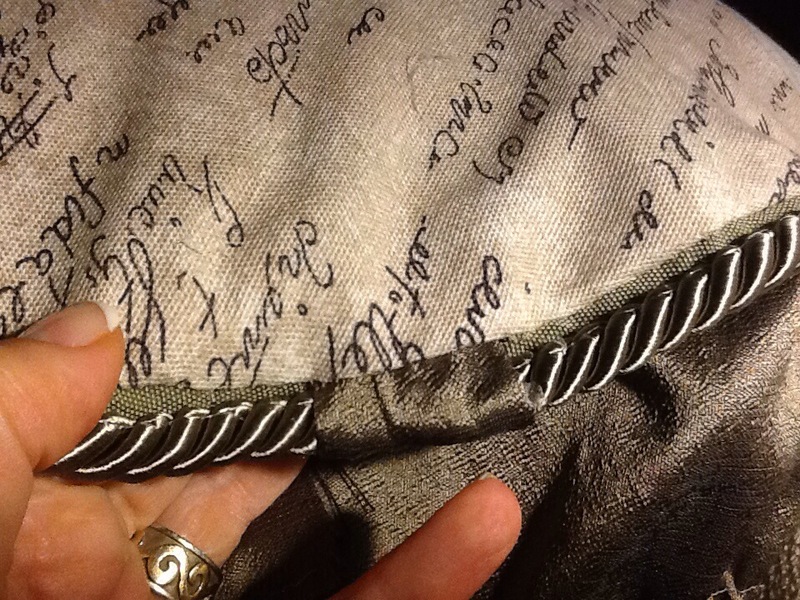 Then I sewed the five belt loops facing down so that I could just turn them up to create the loop. Sorry, it’s hard to explain…I hope the picture helps. 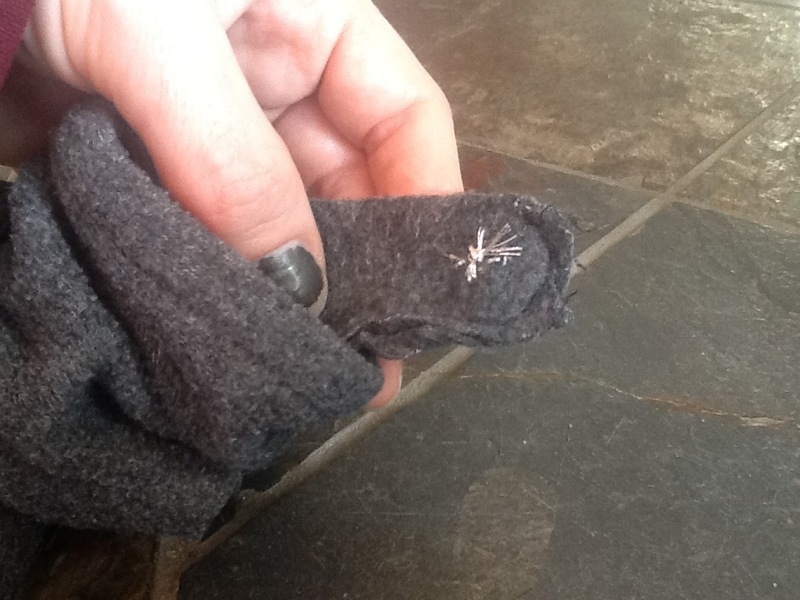 Then I turned the belt loops up and pinned it to the strip of white fur. 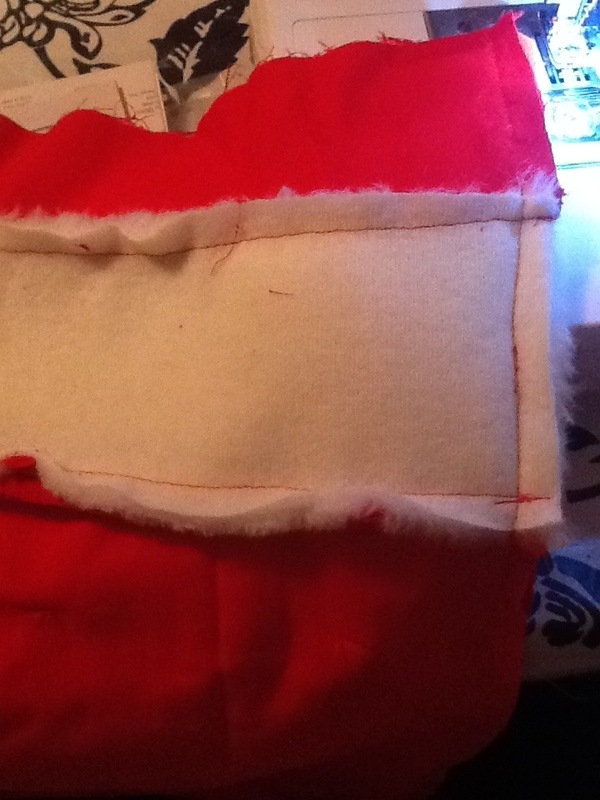 And I sewed the seam, then sewed the next red strip onto the top of the fur. 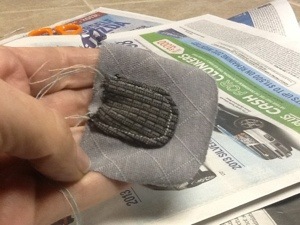 Then I flipped it inside out and sewed down the side seam..
Now for the bottom of the bag. I stitched right across the bottom. 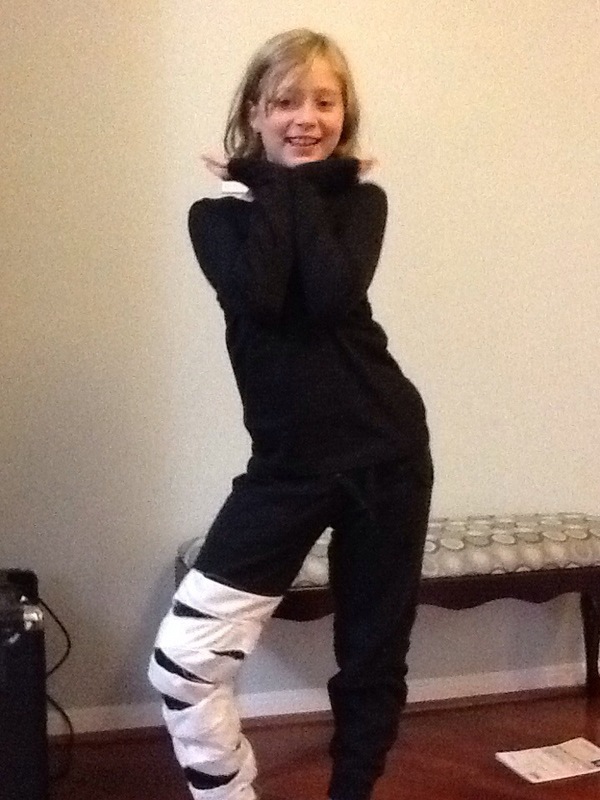 Look at how cute it is with the belt! I stuffed it with some paper, and it’s good to go! I would take a photo of it under the tree, but considering it’s not even October yet, the photo shoot might have to wait a couple months. I might add a cute little gift tag to it before the fair.. 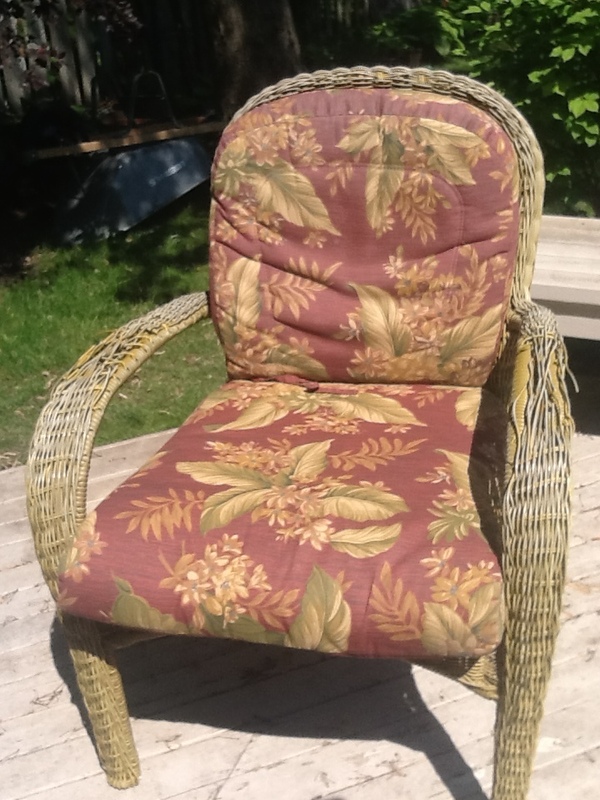 I bought this outdoor fabric from Fabricland that I absolutely loved, but of course, they didn’t have enough for me to do the whole set, so I had to find some matchiing fabrics to use. I found a striped fabric for around the edges, and a plain blue and red for the underneath, and I decided to add some piping out of the blue as well. 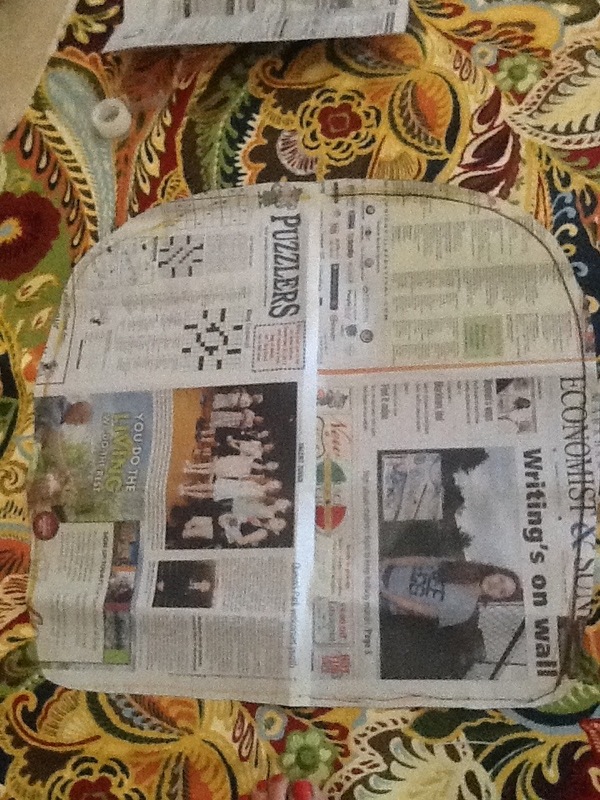 To make a pattern or template for the cushions, I laid out the cushions on top of some newspaper and traced around them. There was one size for the chair backs and another size for the seats of the chairs. There was also a separate size for the two couch seat backs. Then, I added about half an inch of seam allowance around each piec, and folded each piece in half to make sure it was even and symmetrical. 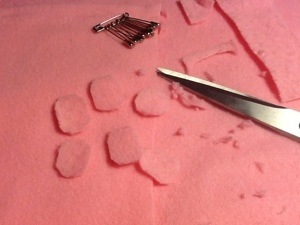 I also added about 10 cm to the tops of each of the pattern pieces to fold over so I could sew them closed. 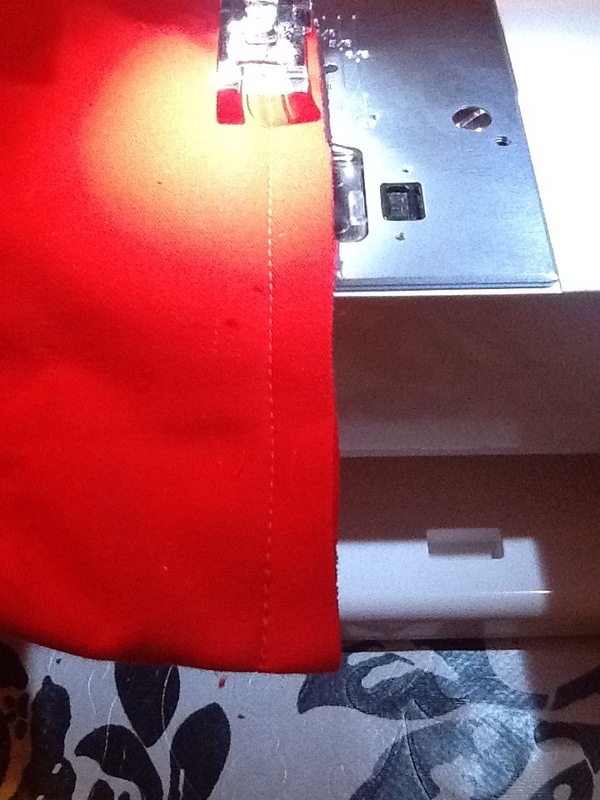 The trickiest part about sewing cushions with piping is rounding the corners. 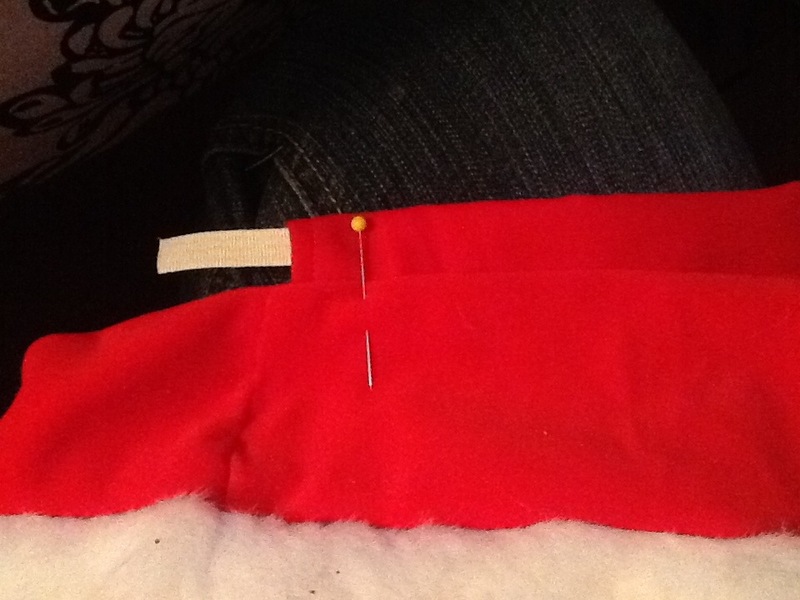 I found that the best way to sew it was to put the piping on the bottom. 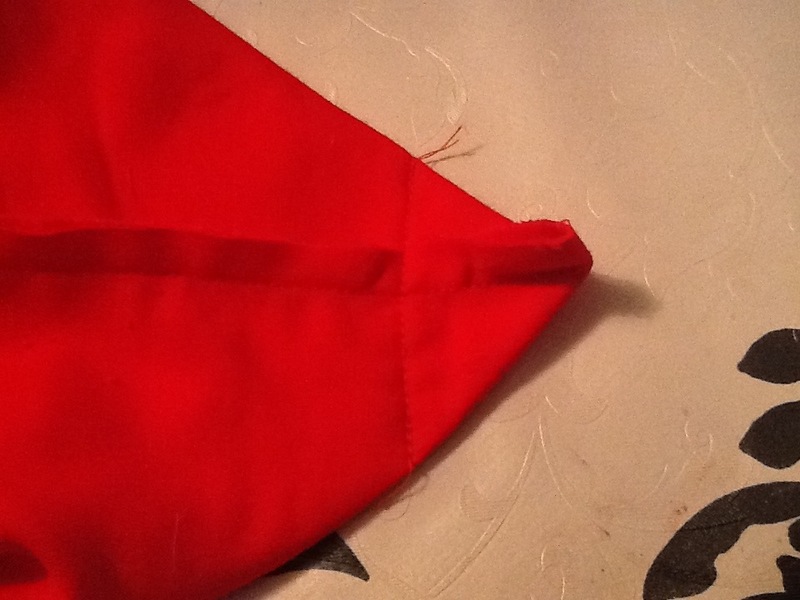 Then when you get to the corner, you rotate the fabric, then sew a few stitches, and rotate again. 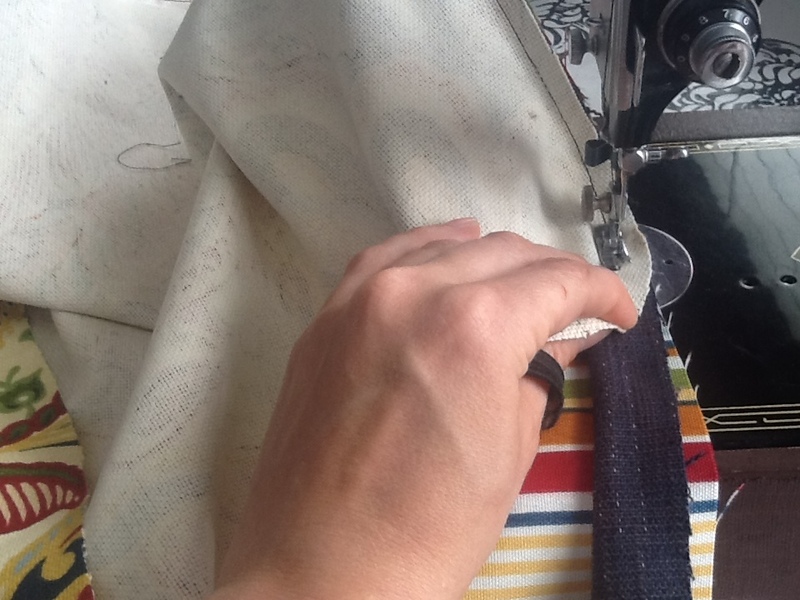 The trick is to try to keep the piping straight and rotate the fabric. Once I finished the cushion tops, I used a blue fabric for the cushion bottoms (I didn’t have enough of the other fabric, and the blue was cheaper. 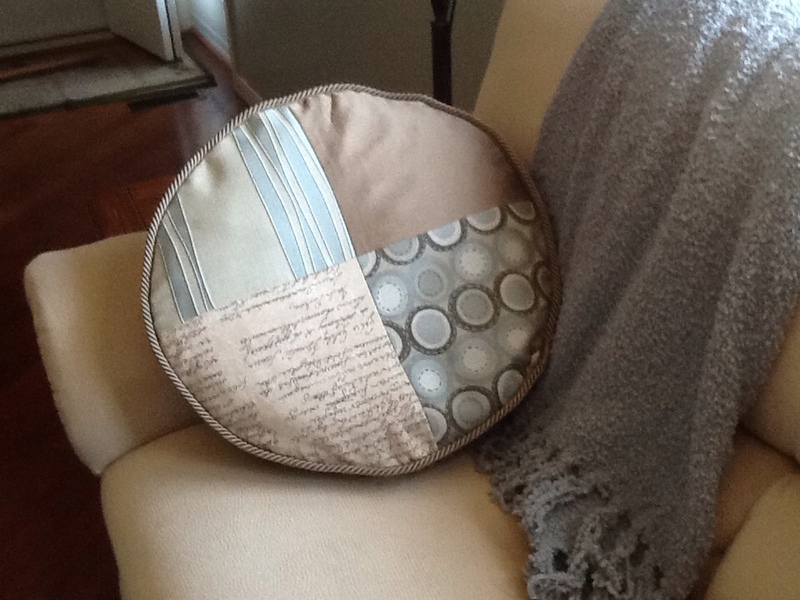 I sewed around three sides and left the back open, then turned it right side out and put the cushion inside and hand stitched it closed. Sixteen cushions later, all I have to do now is stitch a few more closed and add a few ties, to tie them on to the chairs. 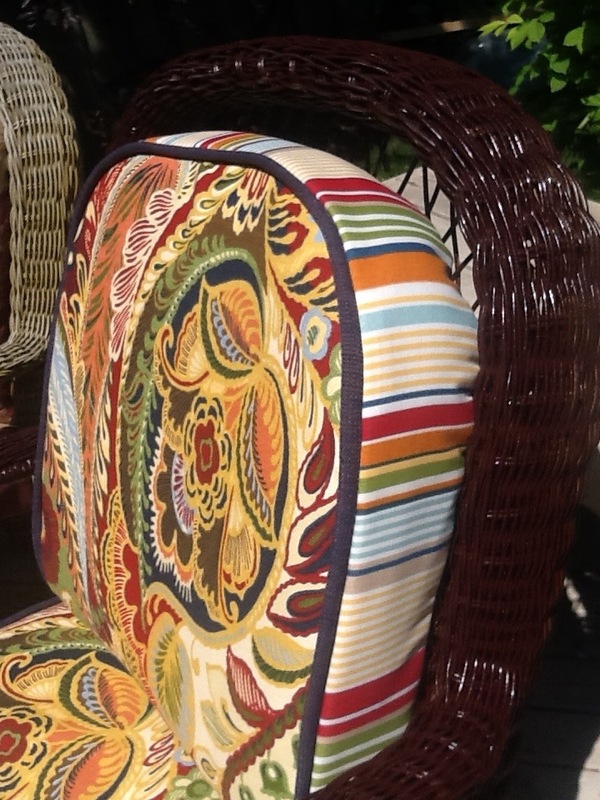 Here is what one of the chairs looks like finished. I am really happy with the way they turned out…. I’ll post more pictures when I finish the set. 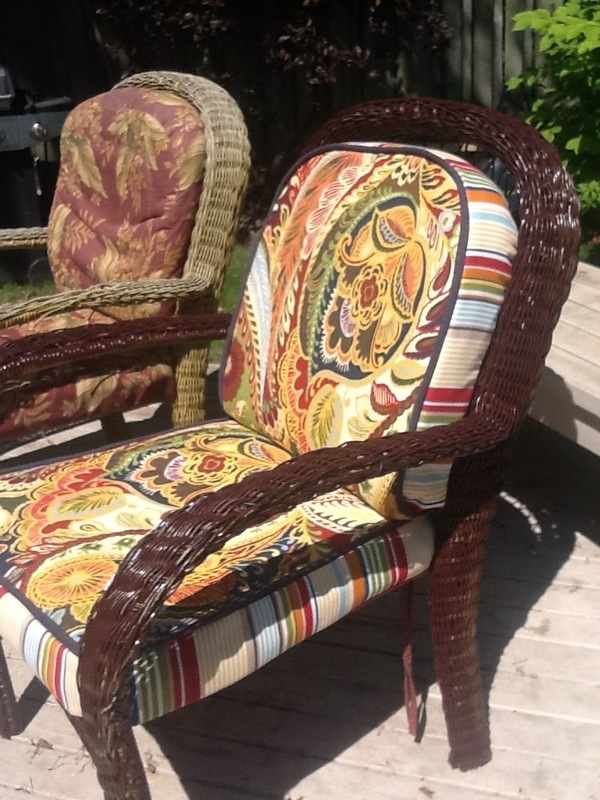 I also have to sand and spray paint the wicker… fun fun fun! 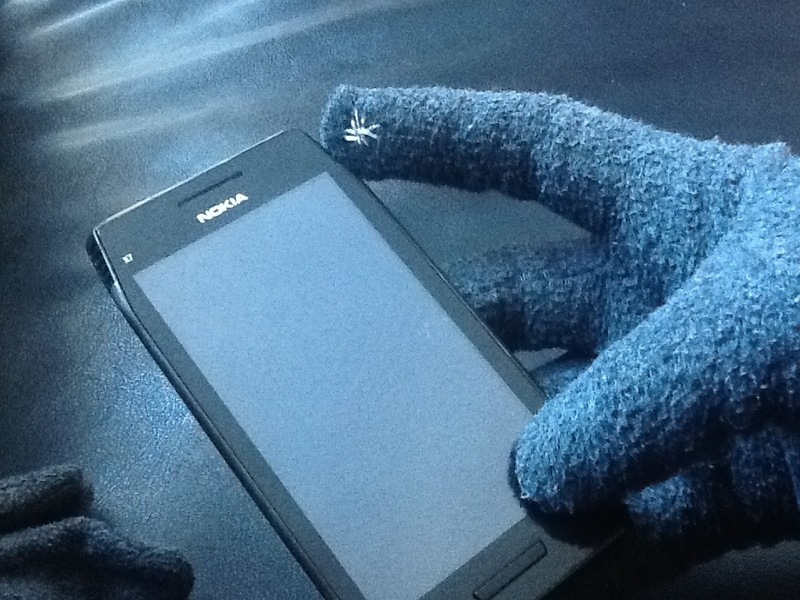 I have no idea how this works, but did you know that metallic thread can convert a regular pair of gloves into touchscreen gloves? Last year I spent $40.00 on the cheapest pair that had holes in them within a few weeks. 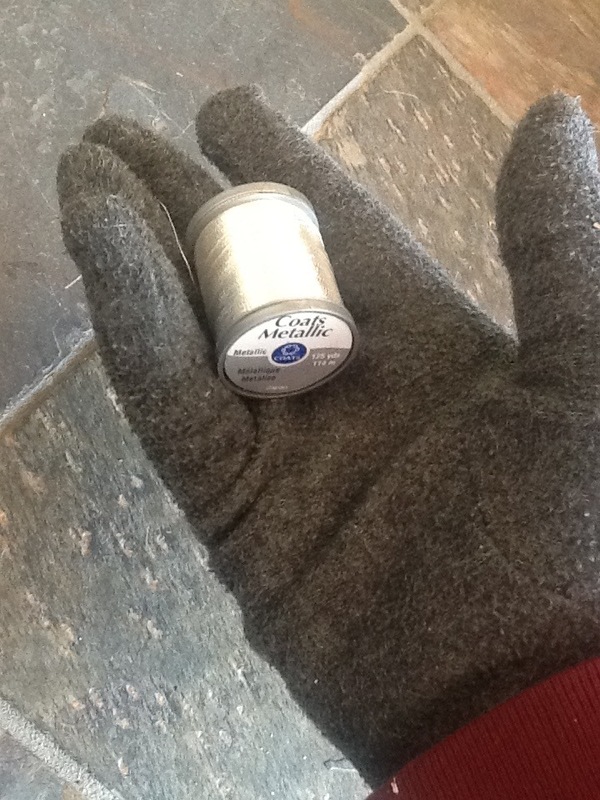 All you need is a pair of gloves, some metallic thread, and a needle. 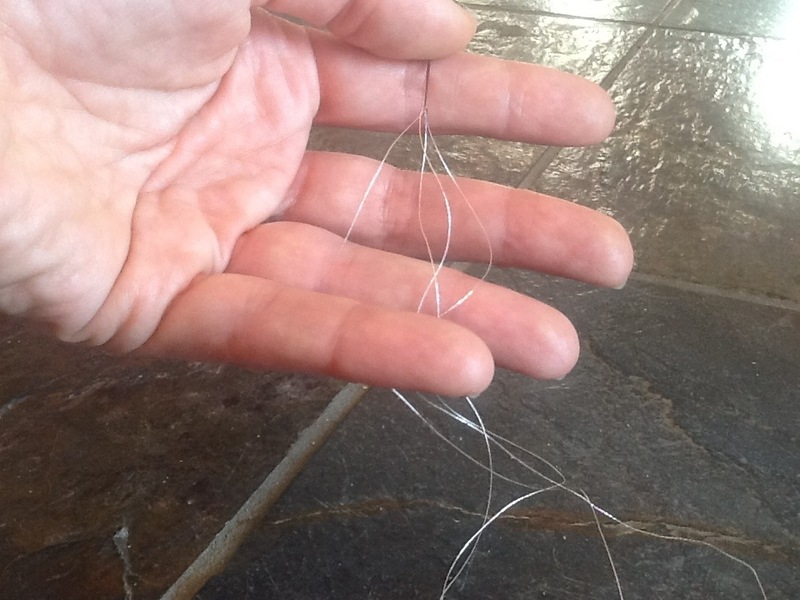 Because the thread was so thin, I folded in half, then threaded the needle so that I was actually sewing with four threads. I turned the glove inside out so that my knot was on the inside, and because I am right handed, I used the index finger of the right glove. 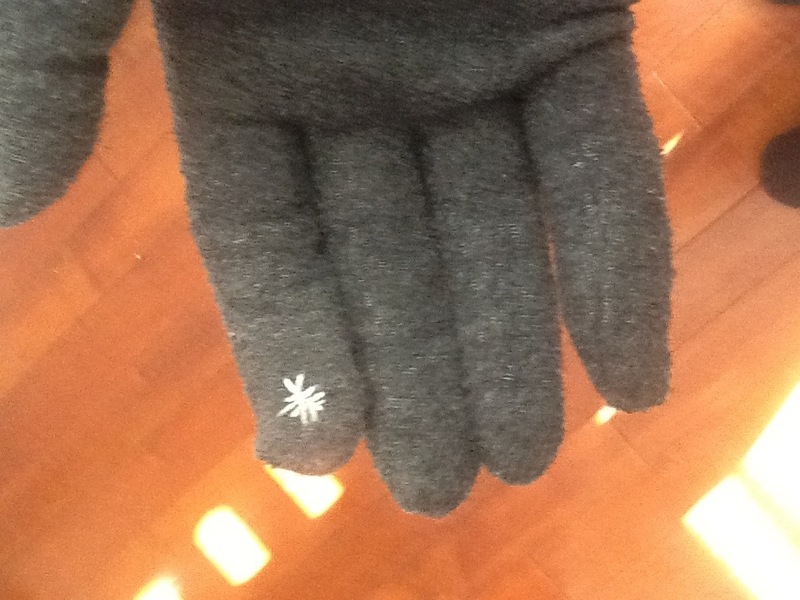 Then, I sewed a little starburst design on the fingertip. 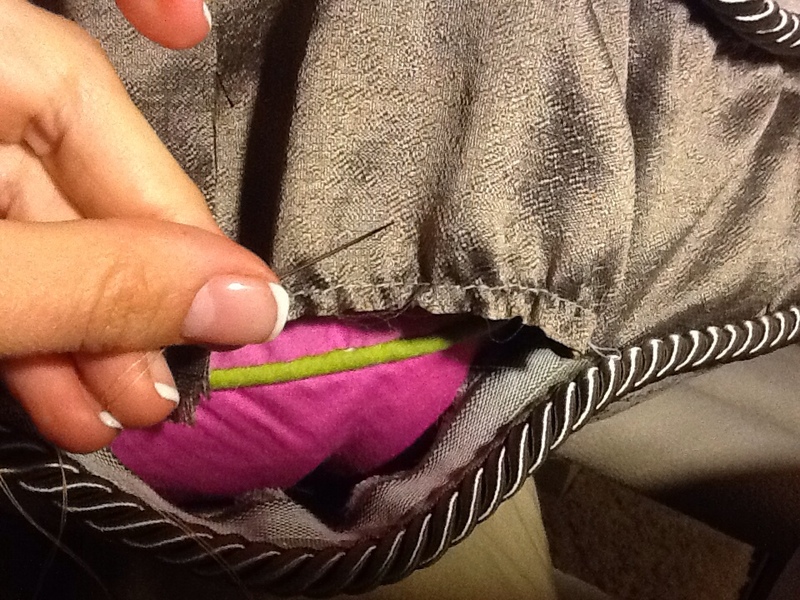 Knotted and cut off the thread from the inside, and that’s it! You just saved yourself $40.00! 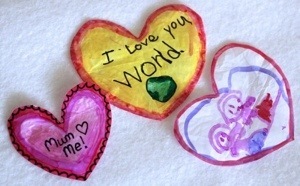 Melted Plastic Bag Valentine Pins! In my quest to find and endless supply of craft ideas to occupy our every spare moment in our house, I came across this website with an idea I had never seen before… art made from melted plastic bags!! 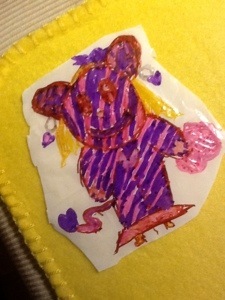 The craft project was to make felt patches or pins by drawing on plastic bags, then ironing them onto felt. No way! I didn’t know you could iron plastic bags! We HAD to try this idea! 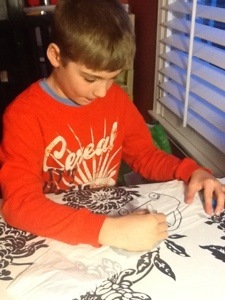 They started drawing their own designs. 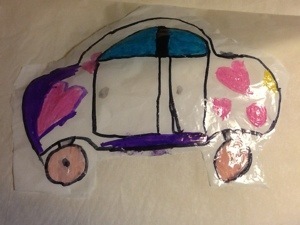 Sam drew a teddy, and Dylan designed a car. The kids found it a little tricky drawing on the plastic because it was a little slippery, but larger pieces of plastic were easier to colour. 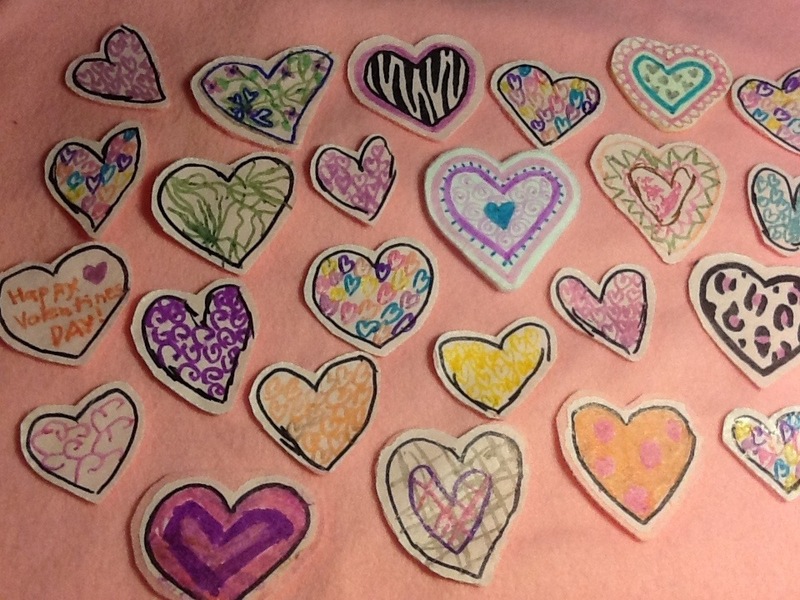 Since it was so close to Valentine’s day, I thought we would also design a few hearts. 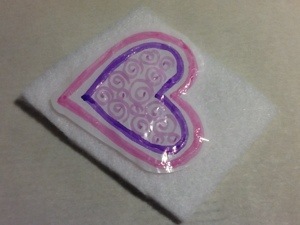 So we coloured a few hearts on the plastic, then cut the polar fleece a little larger than the heart. 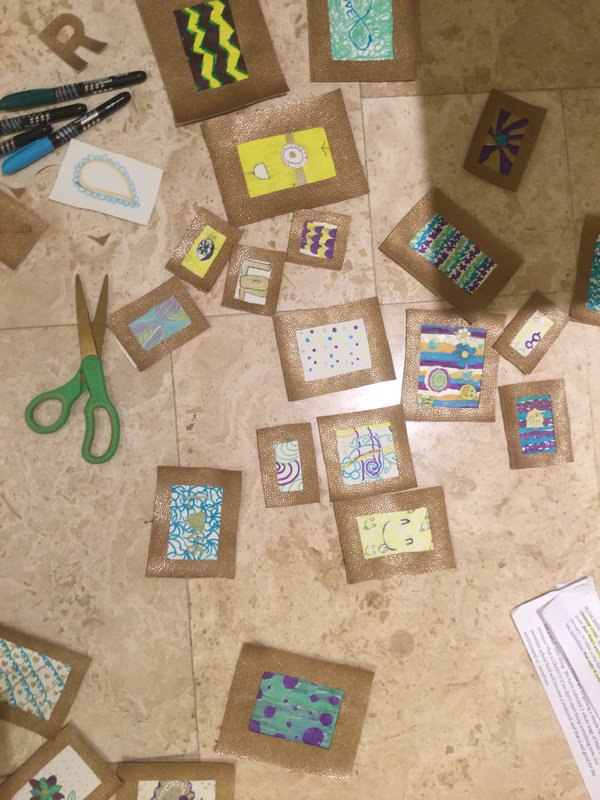 This is important: to iron your plastic bag artwork, you have to use parchment paper between the plastic bag and your iron. 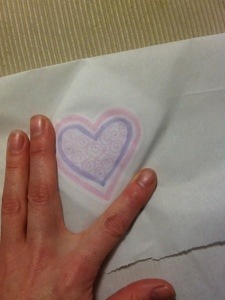 It must be parchment paper, do not use waxed paper, because waxed paper will melt! And ironed it for about a minute at the highest heat setting. It worked! 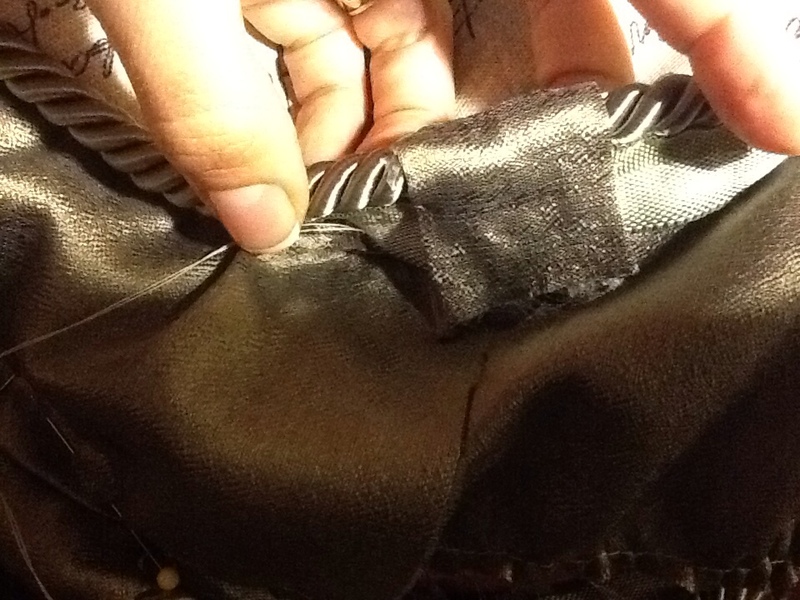 The plastic melted and bonded perfectly to the fabric! The bag melted evenly and adhered itself without bubbling or wrinkling. It looked great, but should mention that I am not sure it could withstand a washing. Also, I would irresponsible if I didn’t mention at this point that you should do the ironing in an area with lots of ventilation, I can’t imagine that this would be too healthy to breathe in for prolonged periods of time. 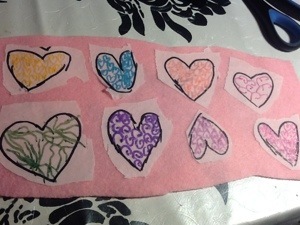 After making and ironing a few hearts, I thought it might be easier for the kids if we ironed first, then coloured. 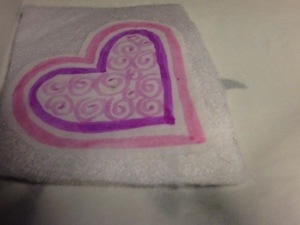 So we drew a bunch of heart outlines on the plastic bag, roughly cut them out, then ironed them onto the fabric. I only ironed enough for the plastic to stick to the fabric. 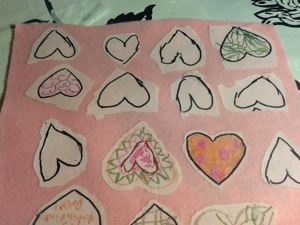 Then, we coloured the hearts in, and ironed them again. It was just easier when the plastic was secured in place. I was really pleased with the way they turned out! 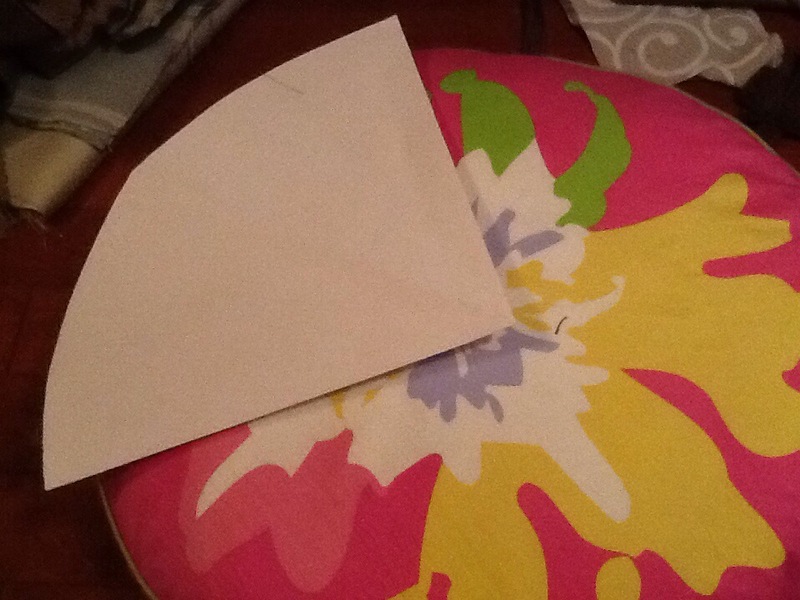 After ironing, the plastic does stick to the parchment, but we learned to wait until it has cooled before peeling it off. If you peel it off when it is hot, the colour peels off as well, but if you wait until it has cooled, the colour will be much brighter. 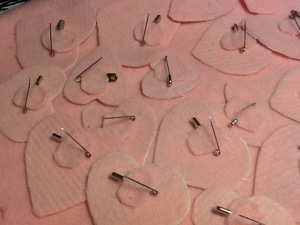 And used a glue gun to attach a safety pin to the back of each one. We ended up making over twenty of them! So, I made another collage photo, and we attached the pins to the photos. 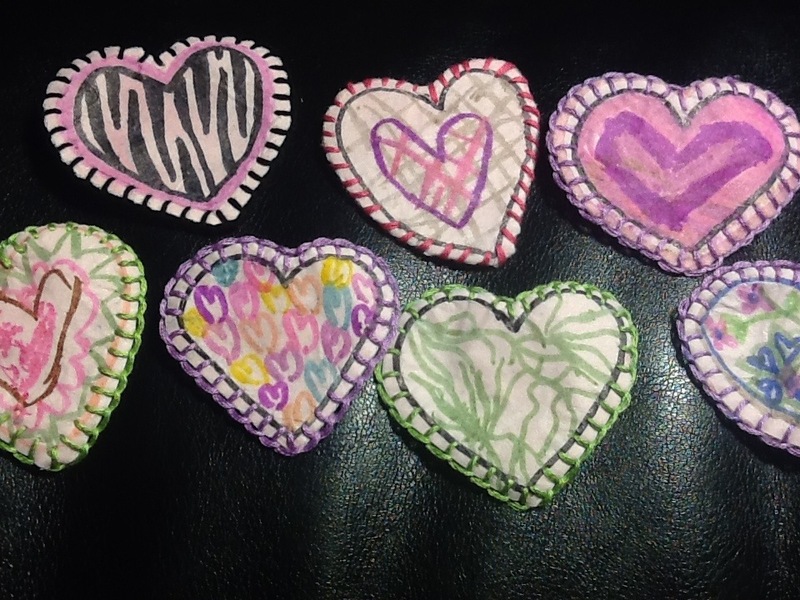 In the past, the kids have made small things and given them out at my Grandfather’s retirement home, or we have gone to visit my Great Aunt, and made some special deliveries to friends in her building. Aunt Isabel, are you free for a visit this weekend? We have some free time on Saturday! I would highly recommend this idea. It was easy to do, didn’t require any special materials, and the finished product is really cute. I think I am going to do this with my Brownie group too! 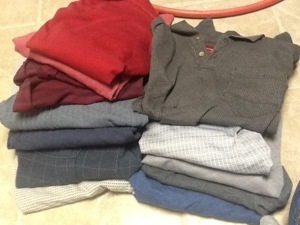 My 96 year old grandfather passed away last month, and my mom and aunt saved me some of his clothes. 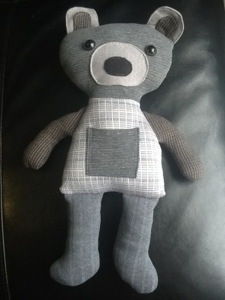 I have been thinking about what to do with them, and I came up with the idea to make a teddy. I thought it would be nice for his children, grandchildren, and grandchildren to have something special to remember him by. Then, I added about 1/4 inch seam allowance to all of the pieces by cutting a new piece, and leaving space around each side for the seams. Notice, I only cut one ear, arm and leg, as I will just cut 2 the same. To start sewing, I started with the ears, I tried a few things, but I ended up making them by sewing two ear centers together right sides in, then I turned them inside out and stitched them onto the outer ear. 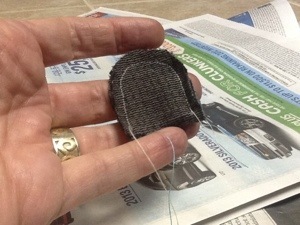 Then, I turned it right side out and stitched around the edge of the ear. 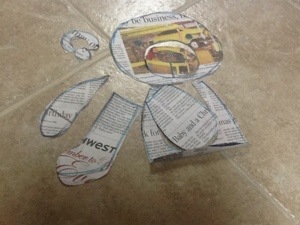 Then, I cut out the rest of the pieces. I decided to stick with a few of his grey t-shirts. 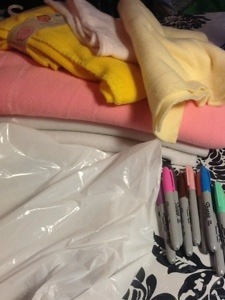 So, I just picked different shades for different pieces. 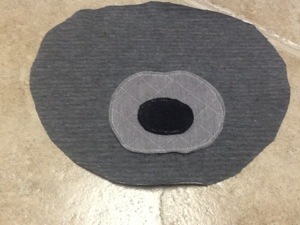 I sewed the snout the same way as the ears, but first I sewed around the perimeter of a black piece of polar fleece, then, I sewed the right sides of the snout together, then turned them right sides out, pinned it on the face, and sewed it down. 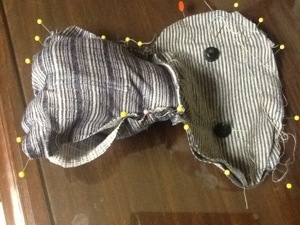 If I make this pattern again, I will try to make the snout a little three dimensional, so it is not so flat. Then, I added the eyes and nose that I bought from the dollar store. They both come in two pieces, the back just snaps on to the front. I and pinned the ears, and sewed across the neck to attach the body and pinned the head and bodies together. 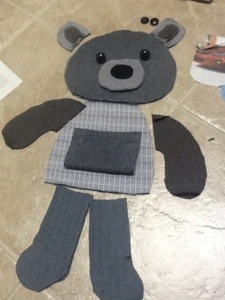 I also cut out a pocket from one of the shirts and sewed it on the bear’s belly. If you knew my grandfather, you would know that he never wore a shirt without a pocket. 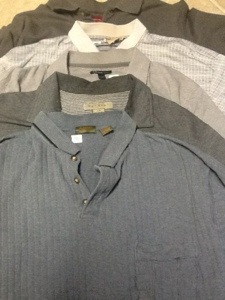 He spent his career working with wood and always needed a pencil or something to put in his pocket, so even after decades of retirement, it was non-negotiable that his shirts have a pocket. So, I thought it was appropriate that his teddy has a pocket too. 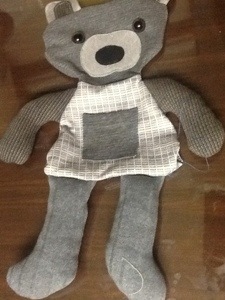 The next step was to sew the arms and legs. 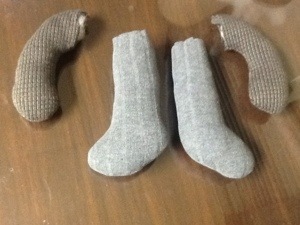 So, right sides together, I sewed the perimeter of the arms and legs, leaving the ends open. 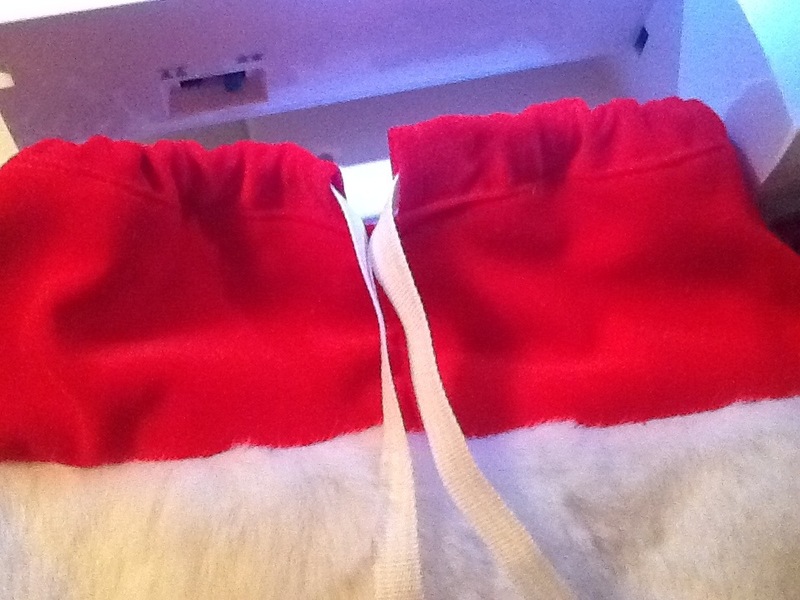 Then I trimmed the seams, turned them right side out, and stuffed them. So, I would say the most challenging part was to put the whole thing together. 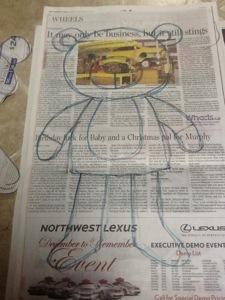 I put the head and body right sides together, then pinned the arms and legs towards the center. 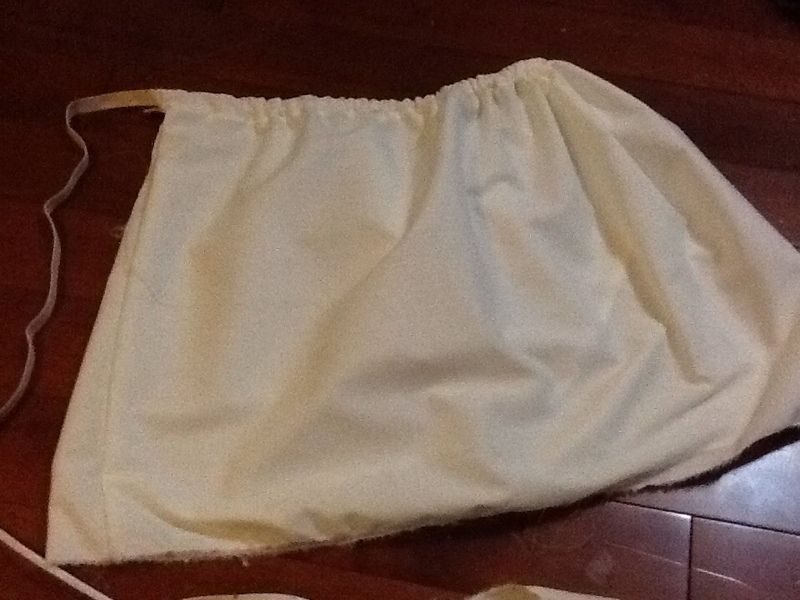 Because they were already stuffed, it was tough…but I used lots of pins and sewed around the outside, and left it open at the side seam so that I could turn it right side out again. I clipped the seams , then turned it right side out. Don’t forget to clip at all of the curves and corners, this makes a big difference and makes all of the curves smoother. 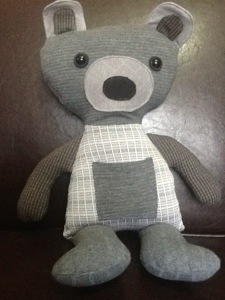 And here is Grampy Bear, all done! I still have lots of his shirts left, so stay tuned! 729,808 Views! Tell your friends!